I grew up next to a cemetery. Although most people would consider that all sorts of creepy, I liked it. 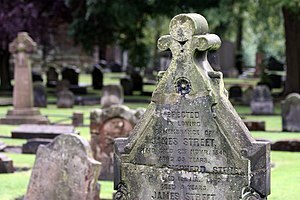 It was an old cemetery with stones dating back to the early 1800’s, some perhaps even earlier if they had still been legible. It was a great place to ride bikes, play hide and go seek, or climb the larger monuments. One of the best things to my 9 year old point of view though was that the cemetery was less than environmentally responsible. They dumped the trash unceremoniously over the bank at the back of the property into the woods where we played. And that is where I developed what to many is the unsavory habit of garbage picking. I know it drove my mom nuts when I was continually dragging home bedraggled silk flowers and plastic flower pots. This chair was one of my dumpster scores. I wish I had taken a before picture, but I didn’t. I washed it well and repainted the wood white. I also painted over the old fabric seat and back with gesso. It took a few coats as it soaked in quite a bit but in the end I had my canvas. I’d been inspired by Valinda’s Art for the Soul shop in Laguna Beach. I like the lighthearted, quirky, colorful furnishings and home decor. The prices, not so much. ($1516.00 for a bar stool on sale, anyone?) Not that artists shouldn’t be able to charge what the market can bear for their creations. It’s just that the new owner will never be me. And I’m ok with that. 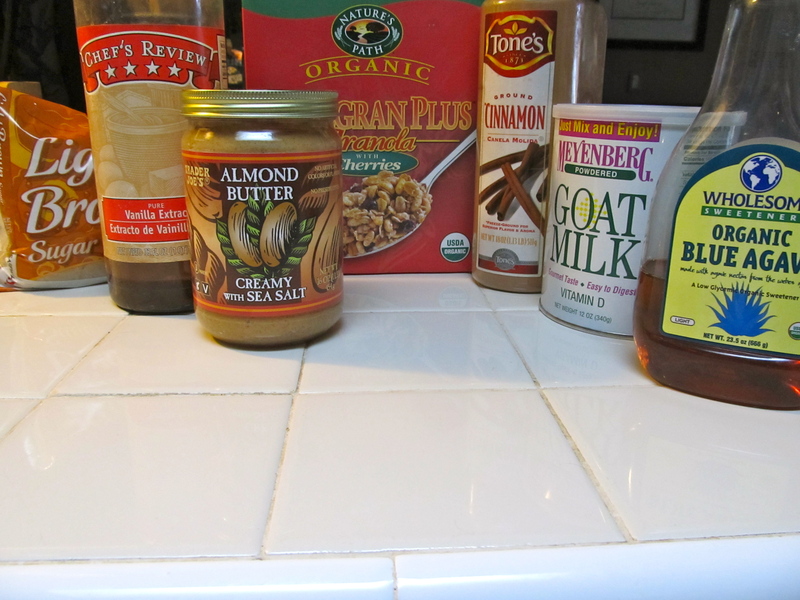 Because my neighbors throw away some good stuff! 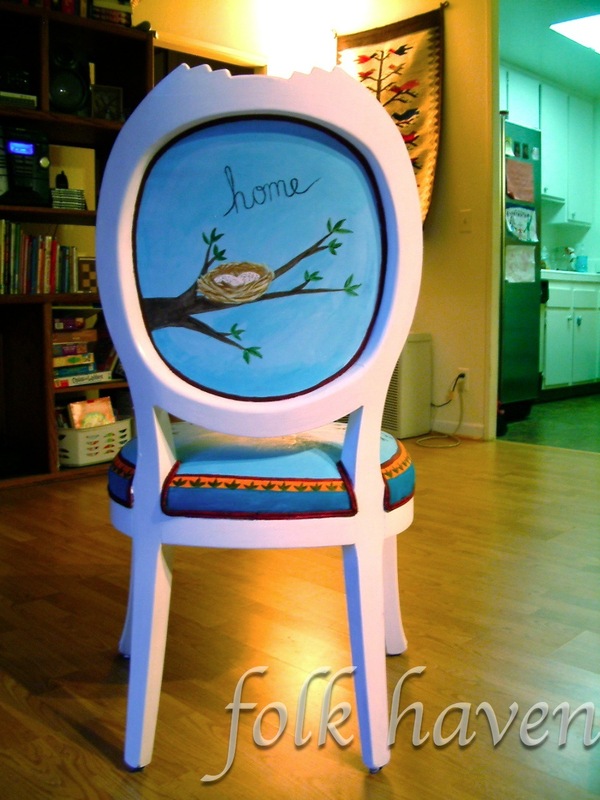 Once I finished my chair I took it to a home consignment shop. It sold in 2 weeks for $90, of which I received $60. Not bad for the cost of my pride some paint and a few afternoons of fun. And whoever bought it got something Art-for-the-Soul-esque for a whole lot less! 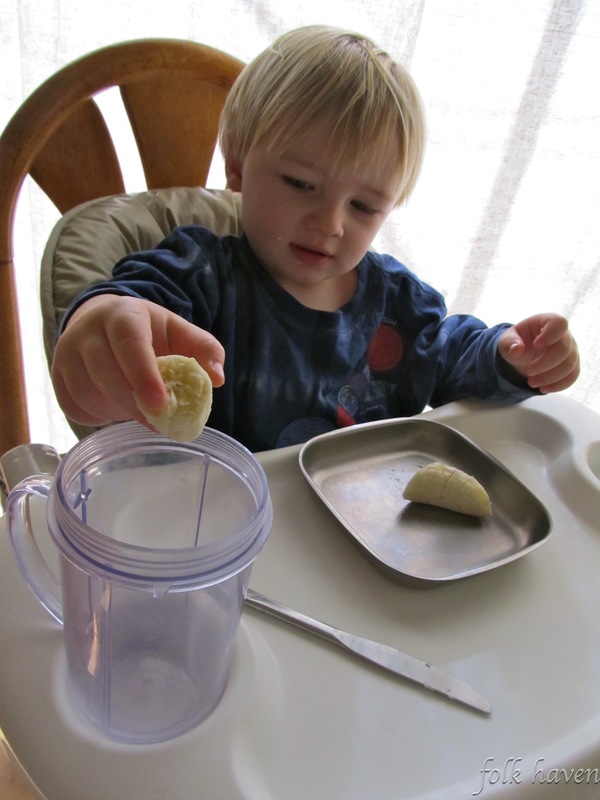 Eli is fascinated with the Magic Bullet that I use every morning to make his goat’s milk. 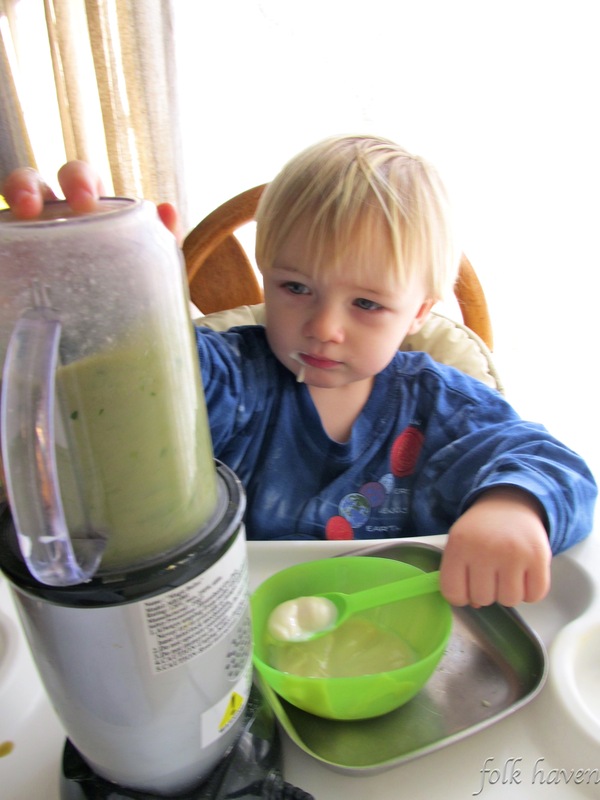 I decided we should have a little fun making a smoothie together. 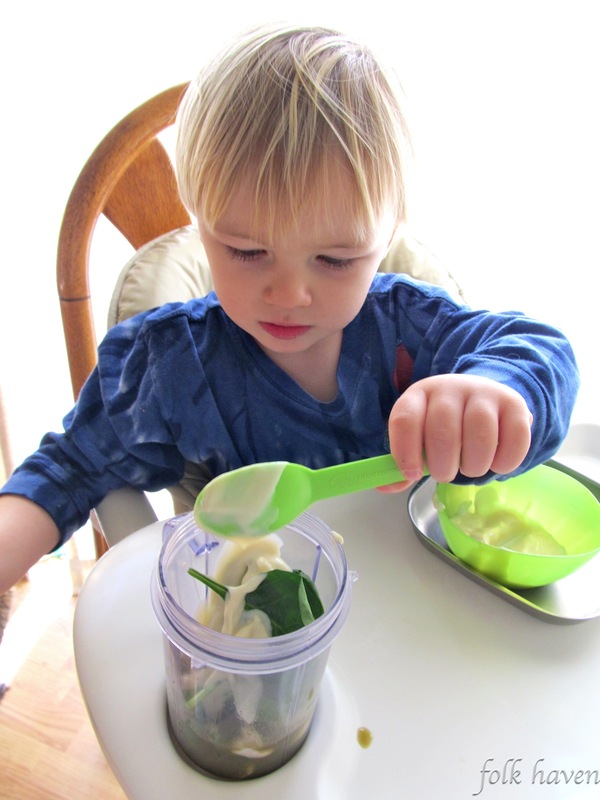 Putting the pieces in the Magic Bullet. 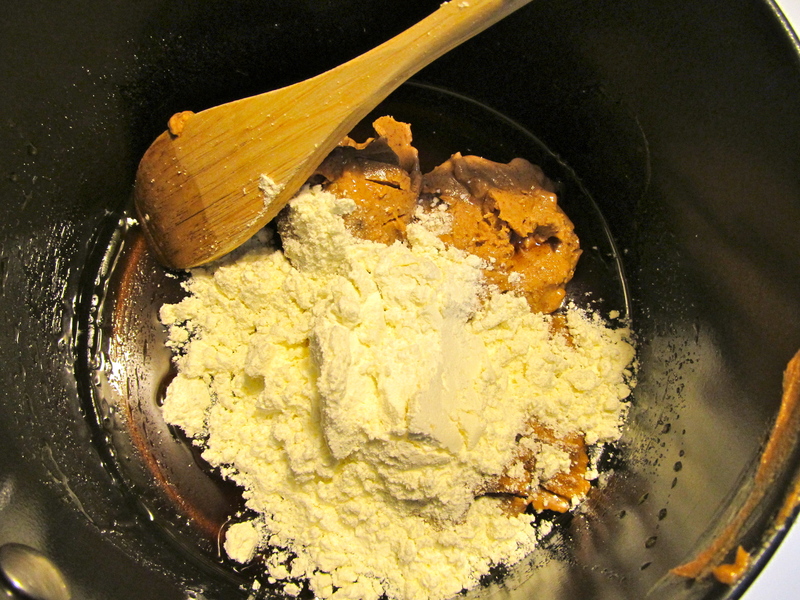 A scoop or four of yogurt. Letting the Magic Bullet perform it’s magic. 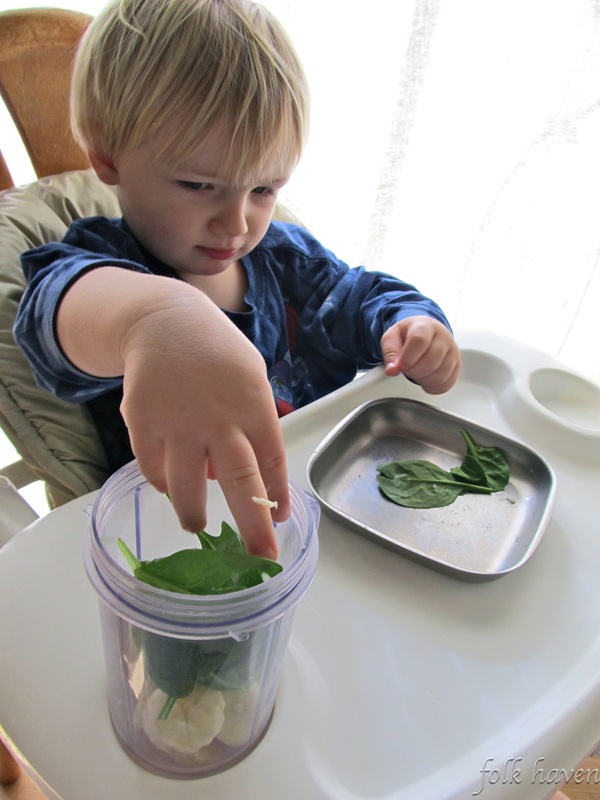 Maybe not long enough though… between sips he picked black bean-sized pieces of spinach off his tongue to discard. 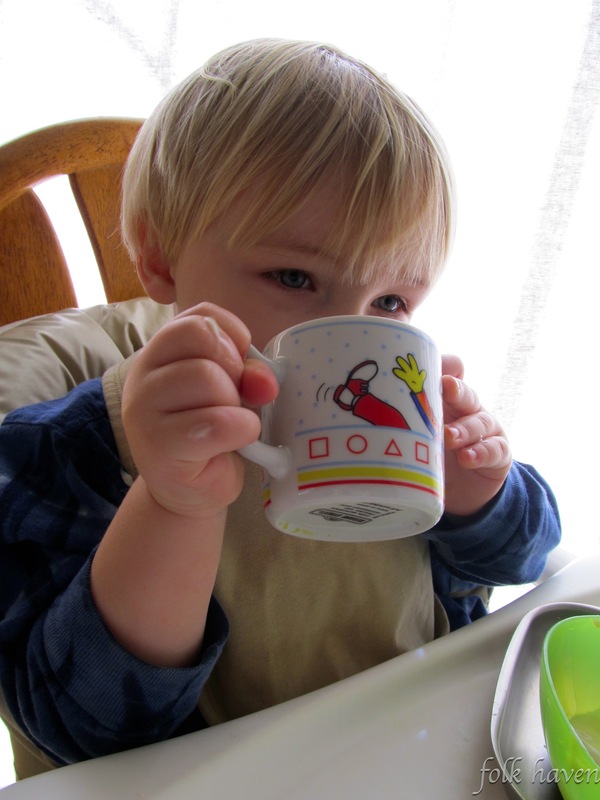 A little in his cup. 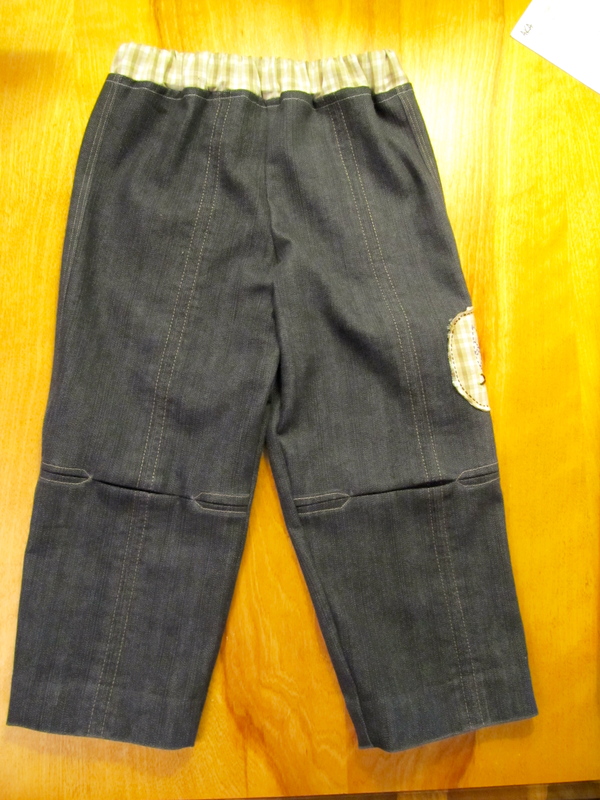 Last week I attempted to make a pair of toddler pants with a knee pleat detail copied from one of Eli’s out-grown jeans. 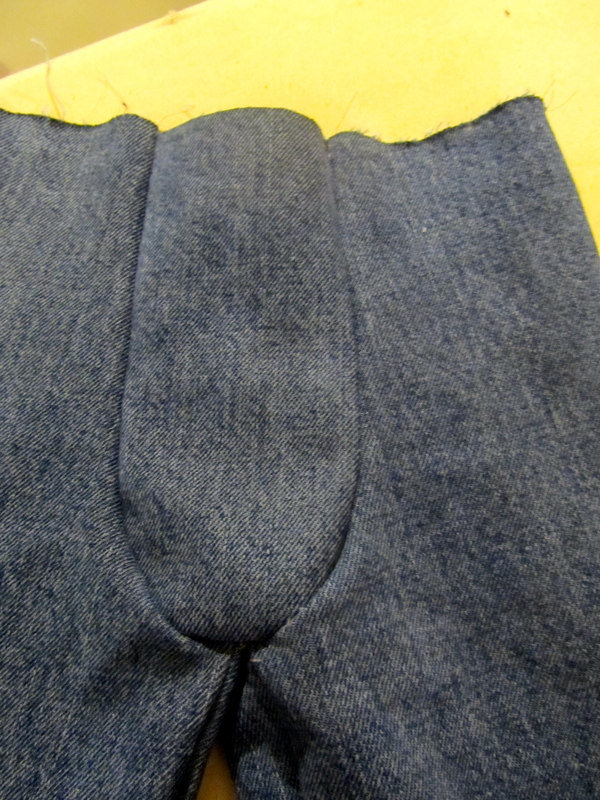 Unfortunately I forgot to add seam allowances when I traced an existing pair of his pants for the patter. 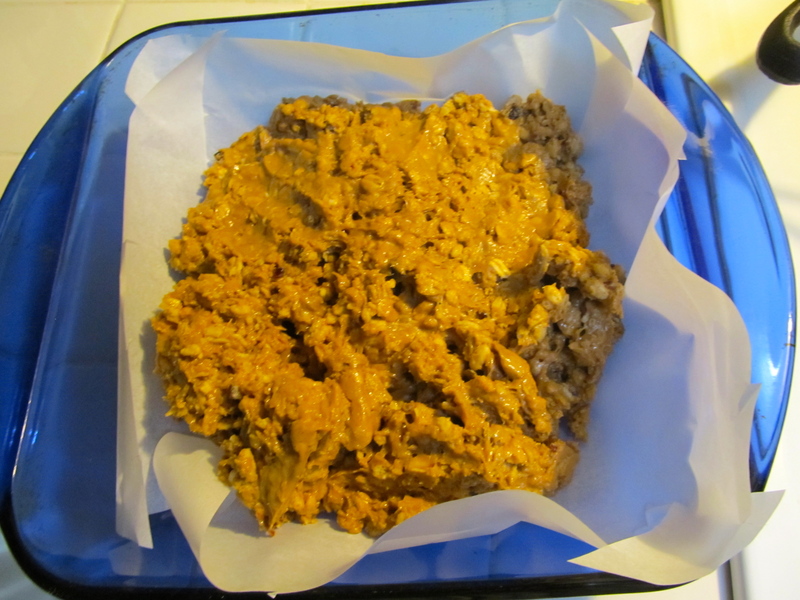 In the end the pants were salvageable, but I didn’t think they were worthy of putting out there in tutorial form. That, however, was LAST week. THIS week I made another pair of pants complete with the beloved knee-pleat detail and feel perfectly confident about sharing the process. Warning: This is a lengthy post. 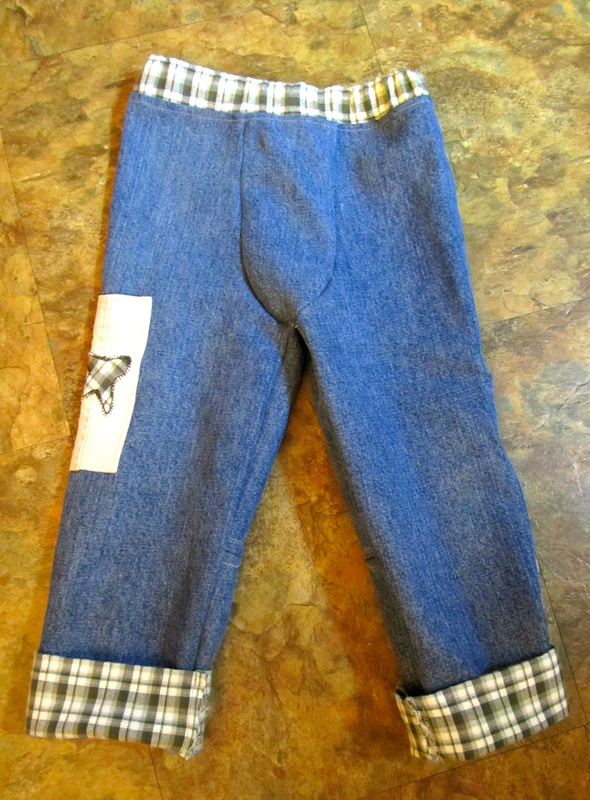 First, trace a pair of pants that fit your child well. 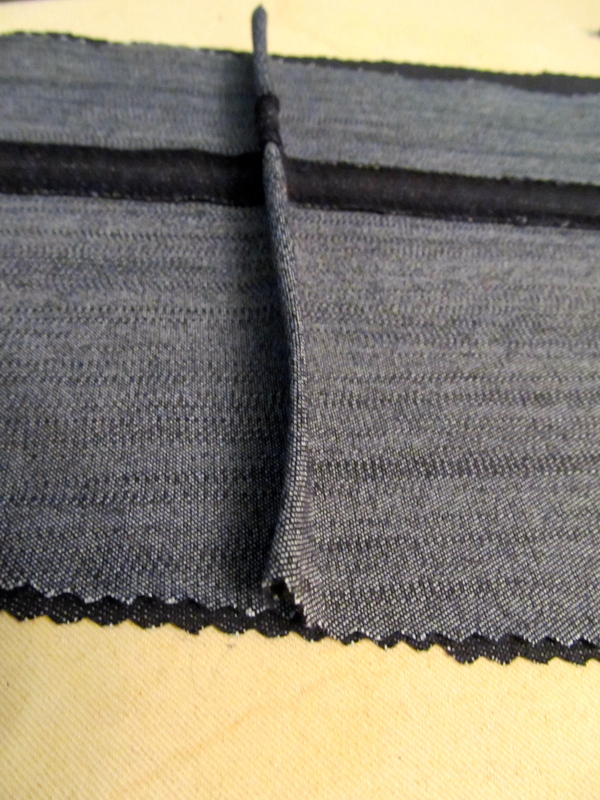 Add 1/4 inch seam allowance to the sides and around the seat and crotch. 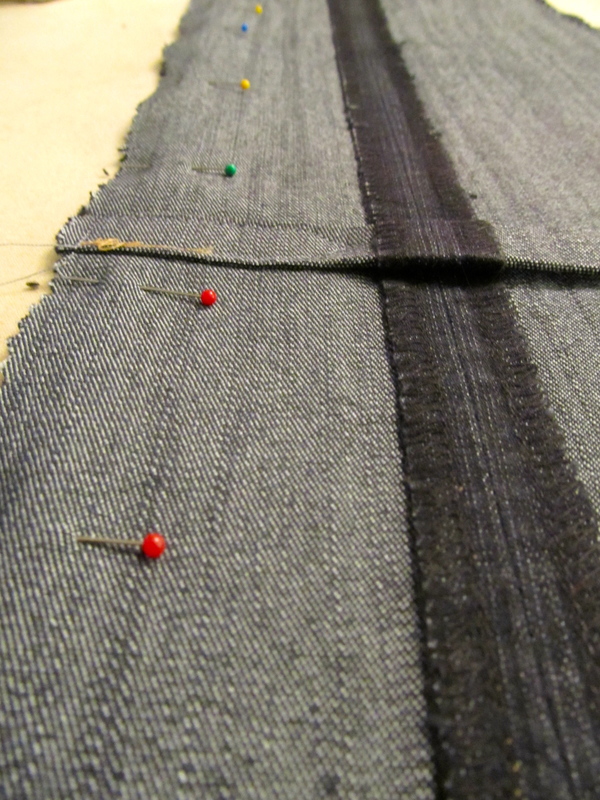 If you will be hemming the pants add extra length for your hem. 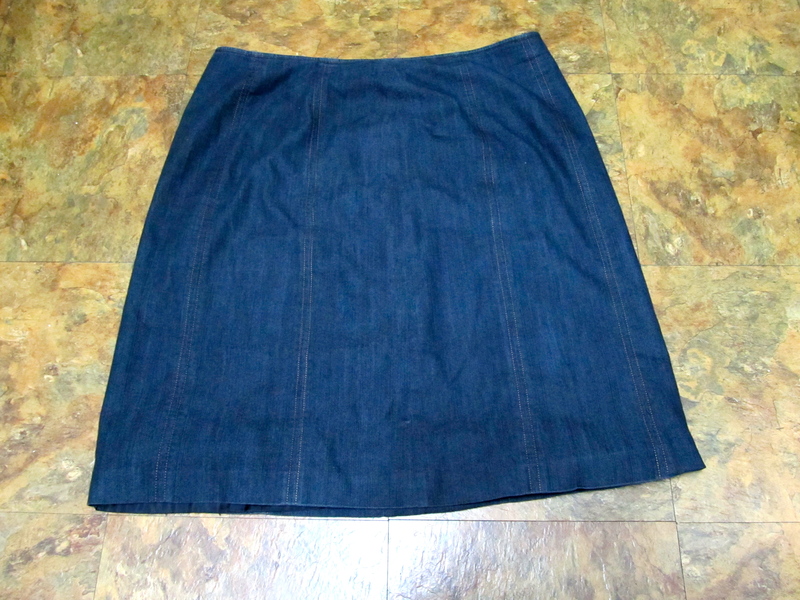 I use a denim skirt for the material and just used the existing hem. 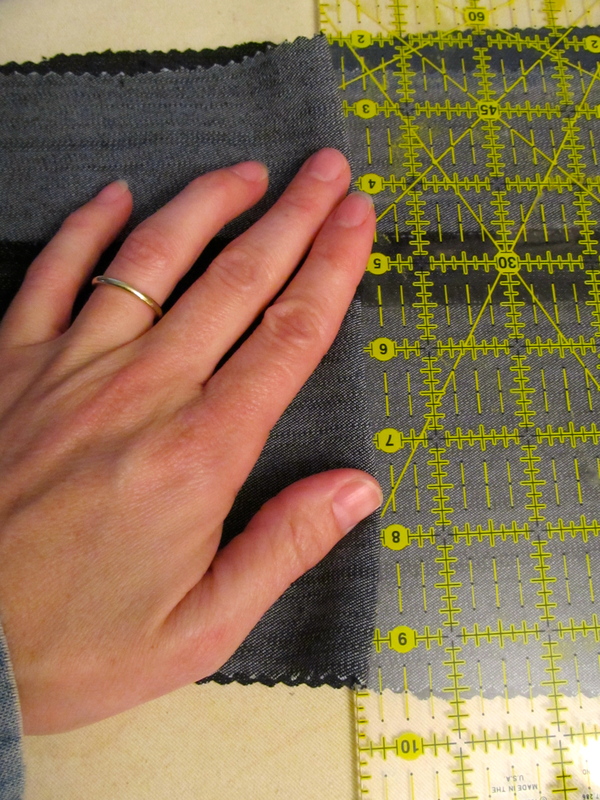 Add 1 3/4″ in length to the front pattern piece only. (I know my pattern says 1 1/2″ but I found later on I needed just a bit more fabric in the pleat. You’ll see why.) 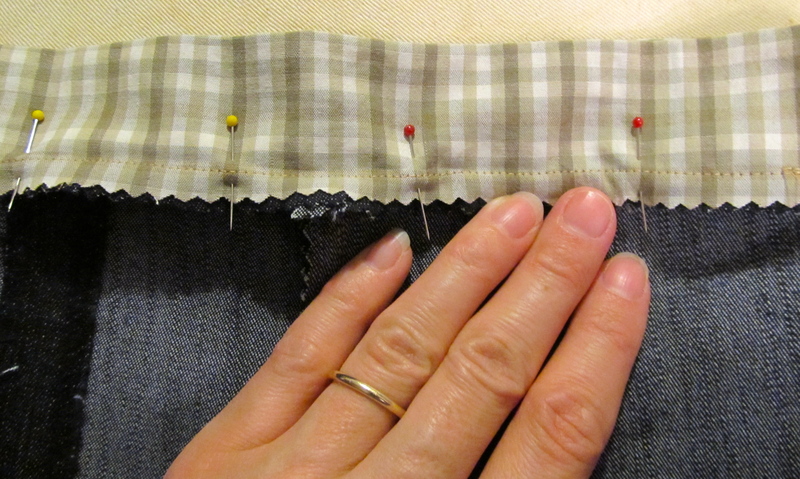 You do not need to add any extra height for a waistband as you will be making that with a separate piece of fabric later. I like to draw pattern pieces on freezer paper because then you can just iron it to the fabric you will be using and it doesn’t shift about as you cut it out. I also like to use fabric from old clothing. You’ll save a LOT of money, keep clothing discards out of the landfill, and if the old clothing had sentimental value you can keep it around that much longer. My friends, family and neighbors keep me supplied with more fabric (for free!) than I can even store well… hence why the blogosphere will most likely NEVER see a shot of my dragon’s lair crafting space. 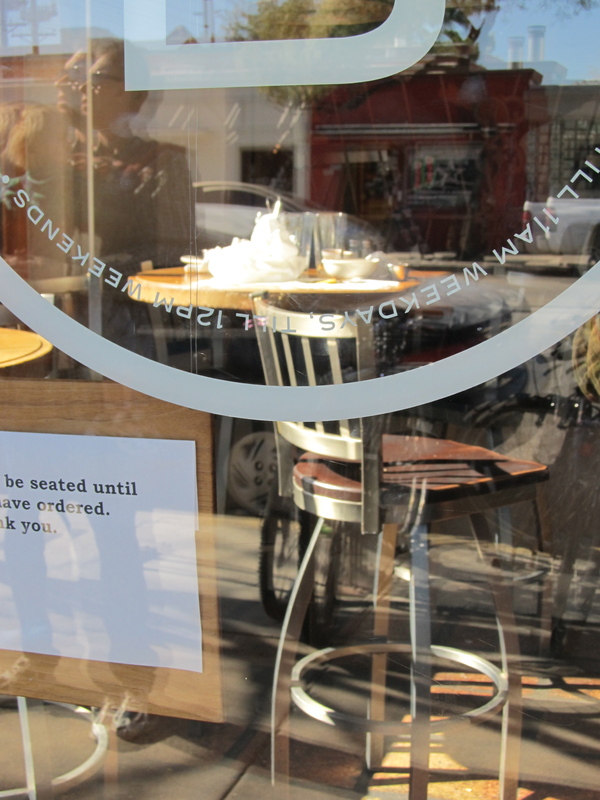 Unfortunately, it is in what was formerly the dining room and is a fully visible part of our home. I think I may have overheard my husband and Eli discussing whether to call that Hoarders program on me. But I digress. For these pants I used this old denim skirt. 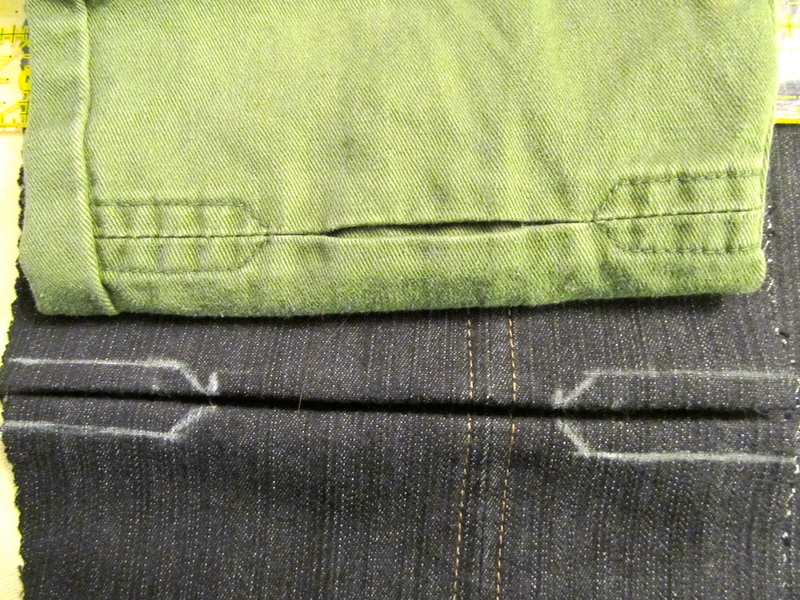 I liked how the stitching became an added detail to these pants. I was after a random effect, but needed to cut out the pattern pieces so that the existing seams in the fabric wouldn’t end up making the seams in the pants too bulky. In the end I got stiching stripes down the middle of the front and back of each leg. Not very random, but it I liked the end result anyway. Lay out one of your back pieces with the corresponding front piece on top, right sides together. Match up the points at the crotch then match up the bottom of the legs. The front piece is longer so there will be extra fabric. Locate where the knee will be in these pants. Eli is between sizes 2T and 3T right now. The knee on these pants falls 7″ up from the bottom. After measuring to find the location of the knee, turn the ruler perpendicular to the pant leg. smooth the fabric from the bottom up until the bump of excess fabric is stopped at the ruler. 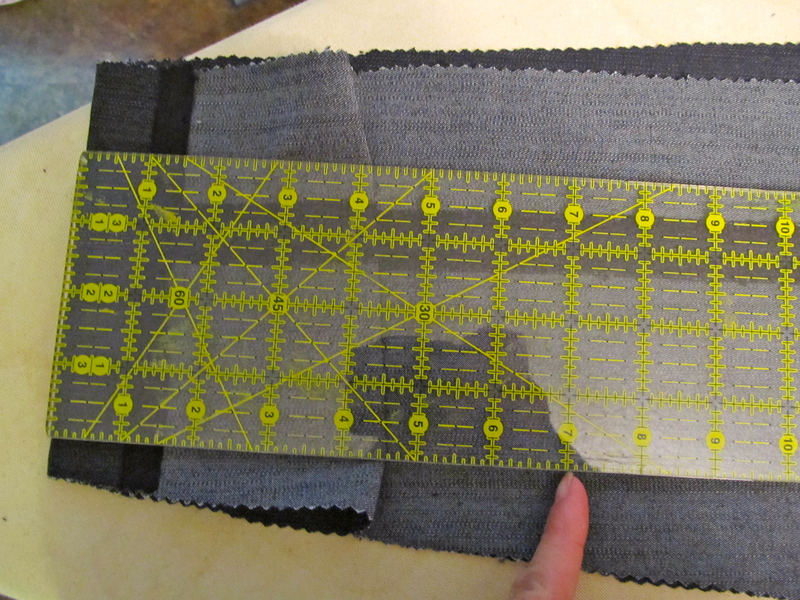 Remove the ruler and iron the excess bump of fabric down, first folded up, then down. Push the excess fabric straight down from the middle so that it is equally distributed over the pant leg above and below the pleat. 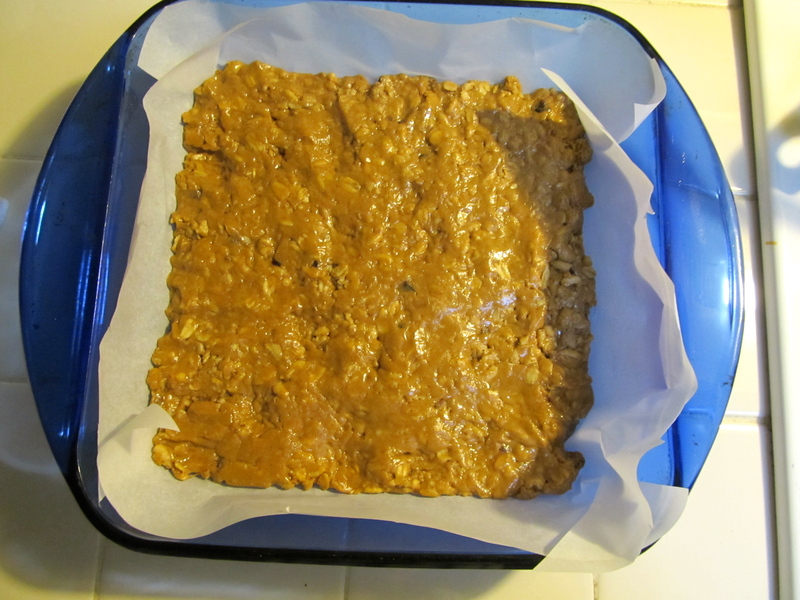 Iron it down well to create very crisp folds. This is what it should look like when you turn the pant leg over. 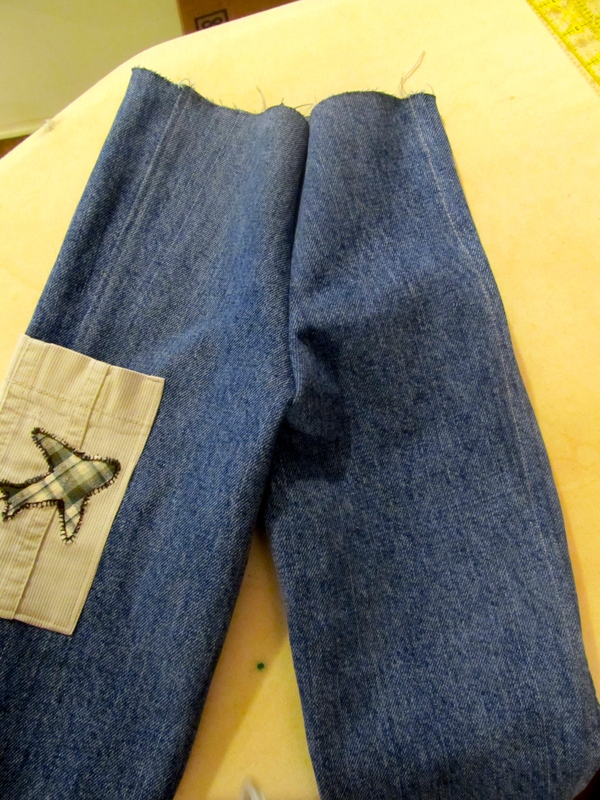 Pin the pant leg front and back together along the outer seam and sew. 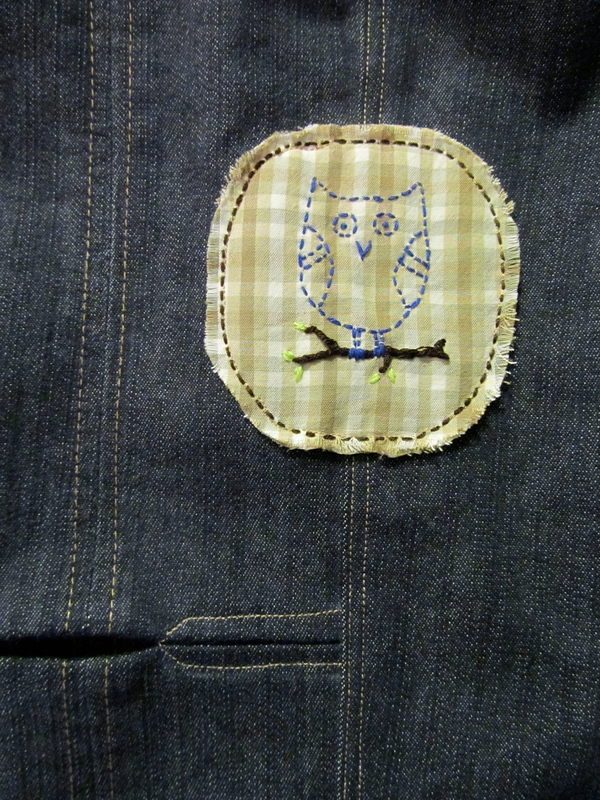 After attaching the 2 pieces I added 2 lines of top stitching. 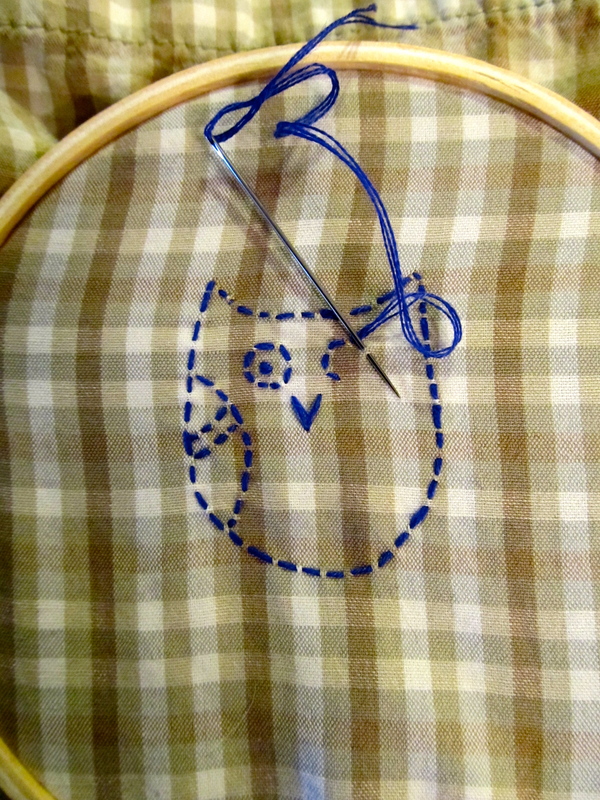 One of these days I’ll try using a double needle but they kind of intimidate me. 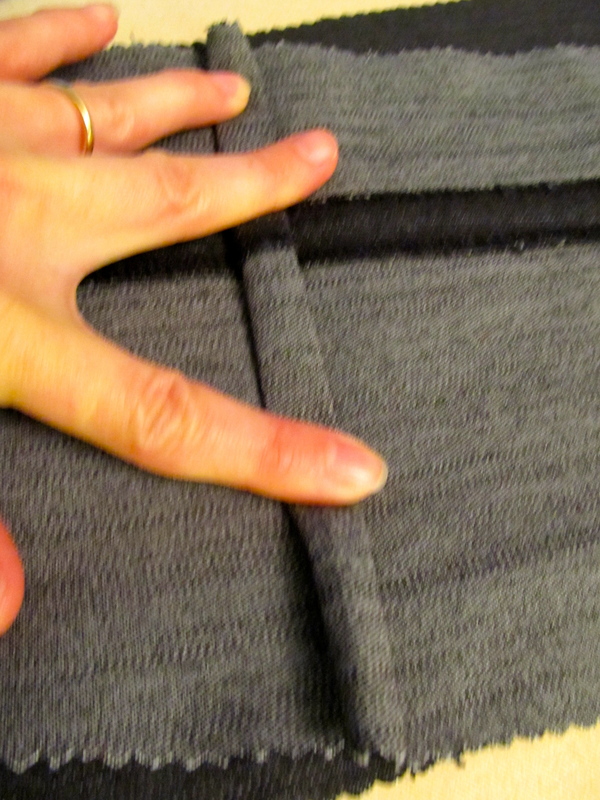 Here you can see the sewing on the knee pleat as well. Repeat these steps with the 2nd pant leg. 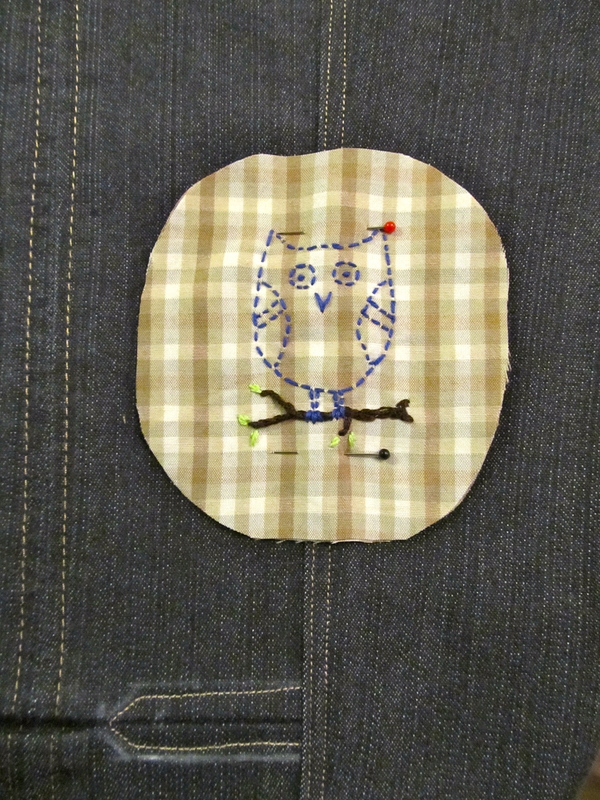 I wanted to add a little decoration to these pants so I took some fabric from an old shirt sleeve and embroidered an owl. I used 2 layers of fabric, both to give the embroidery stitches more stability and because I planned to leave the edges raw and wanted them extra fuzzy. 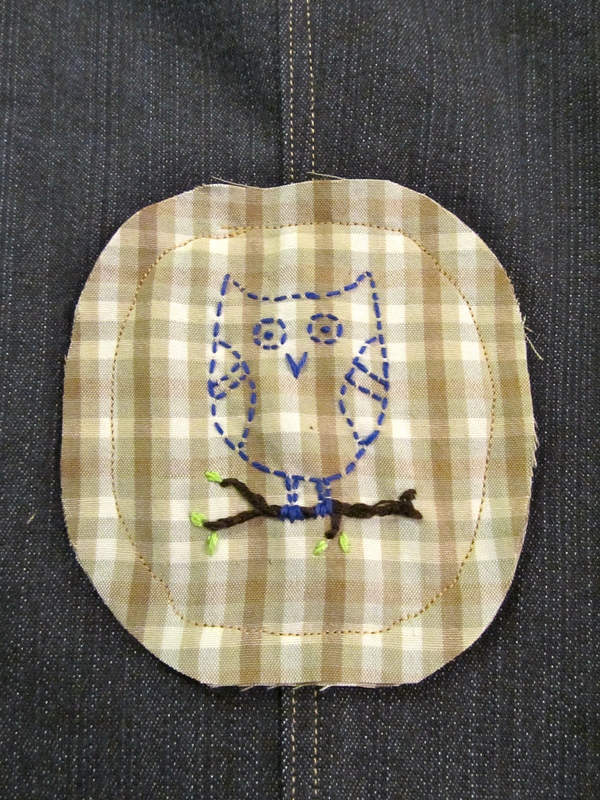 When I was done embroidering I cut out the owl and pinned it to the side of the pant leg just above the knee, more or less where a pocket on a pair of cargo pants would go. 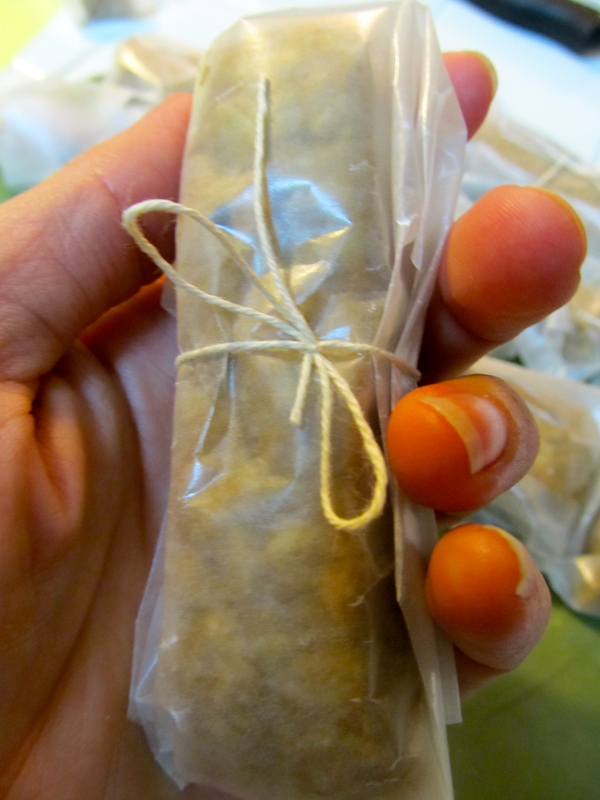 I sewed around the edges 1/4″ in. My sewing line is a little wonky, but it won’t really show after the next step. I embroidered a border line over the machine stitches. 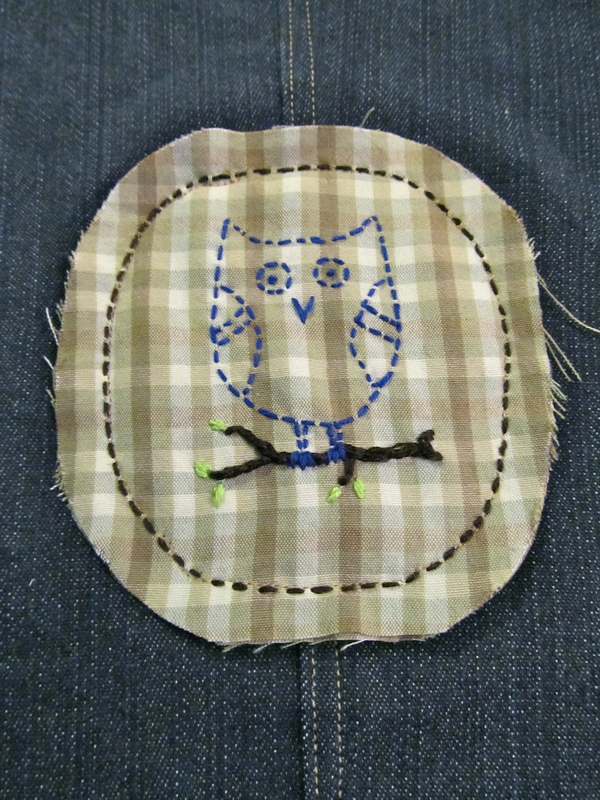 Then I trimmed about 1/8″ of the excess fabric around the owl detail and picked out some of the loose threads. It will get fuzzier after washing and with time. 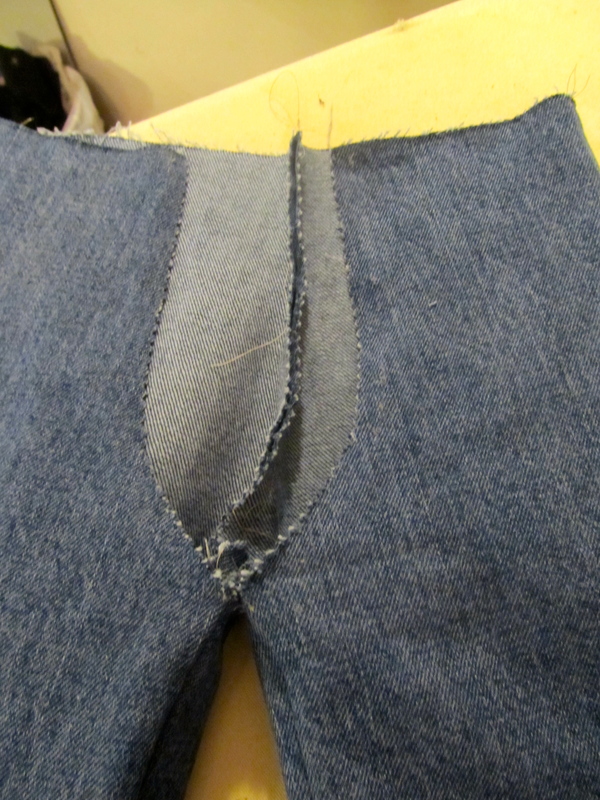 Now I pinned and sewed up the inside seam of the legs. Turn one leg inside out and insert it over the right side out leg so that the right sides are together. 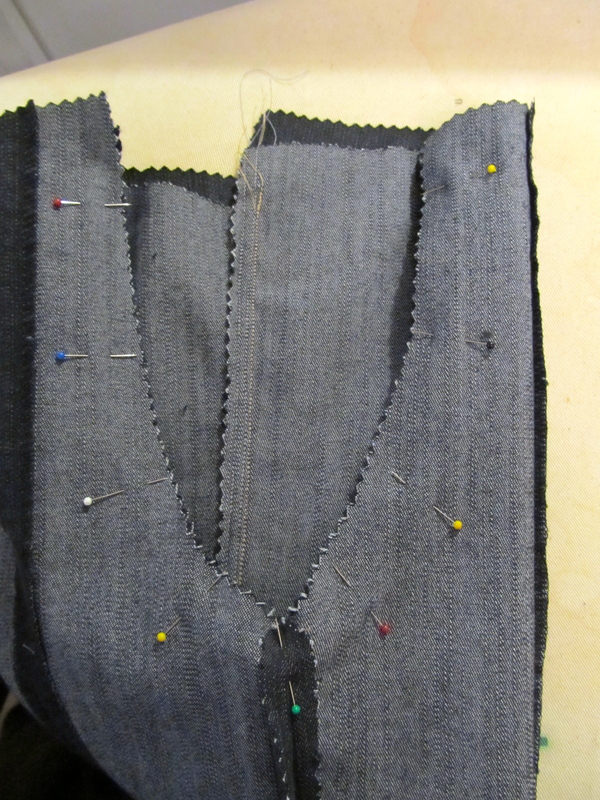 Pin around the opening, lining everything up from the midpoint of the crotch. When you sew go back and forth a few times where the seams converge in the crotch. When I make a pattern for a pair of pants with this style of waist band I don’t spend much time worrying about the top of the pants. It just doesn’t matter. 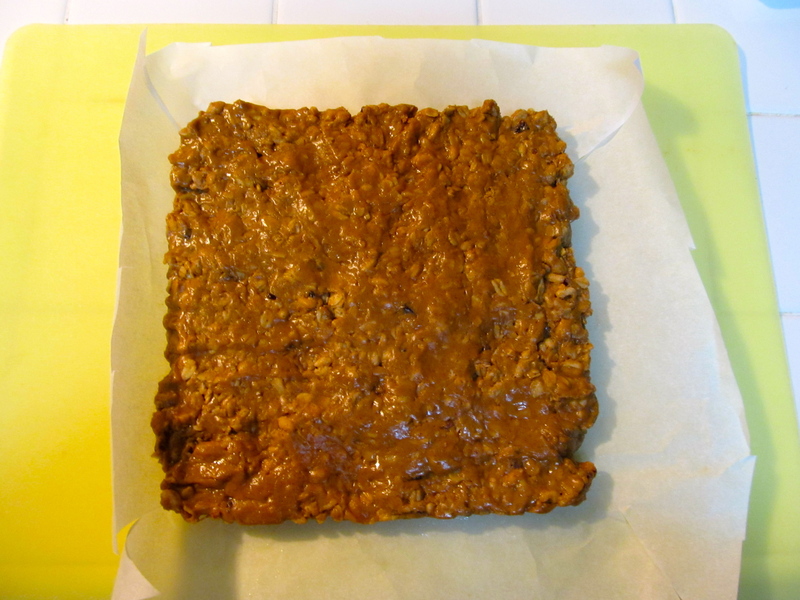 Now that they have come together, turn them right side out and trim the top so everything is even. Iron it in half the long way. Open it and join the two ends. 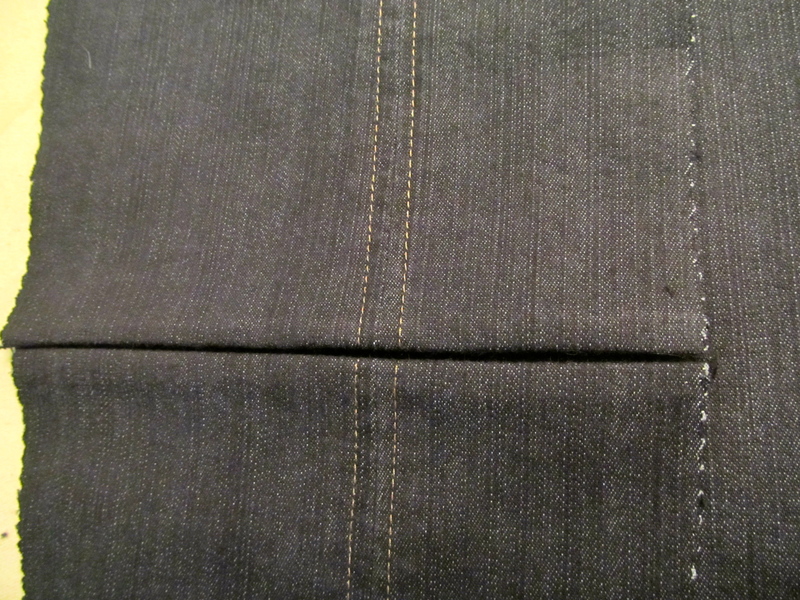 Pay attention to the seam allowances being hidden when you fold it in half again. 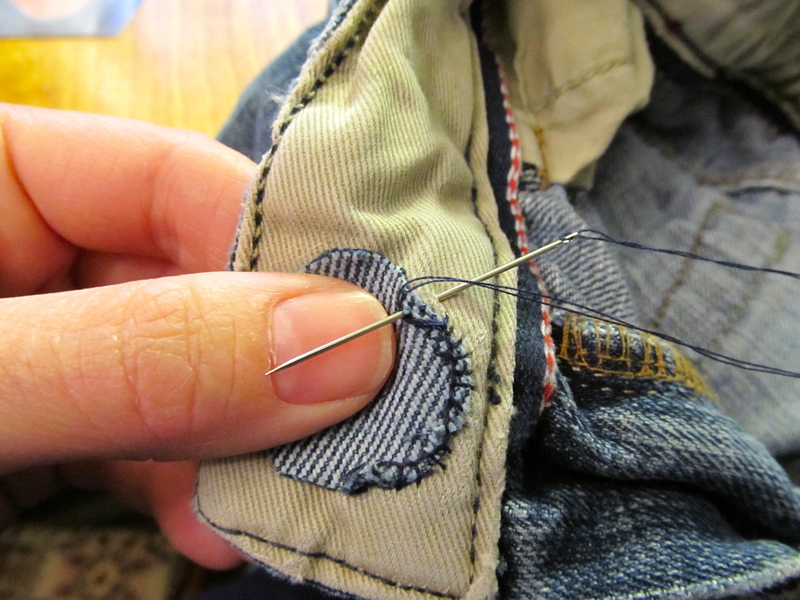 Pin the folded ring of fabric around the top of the pants with the folded edge down. 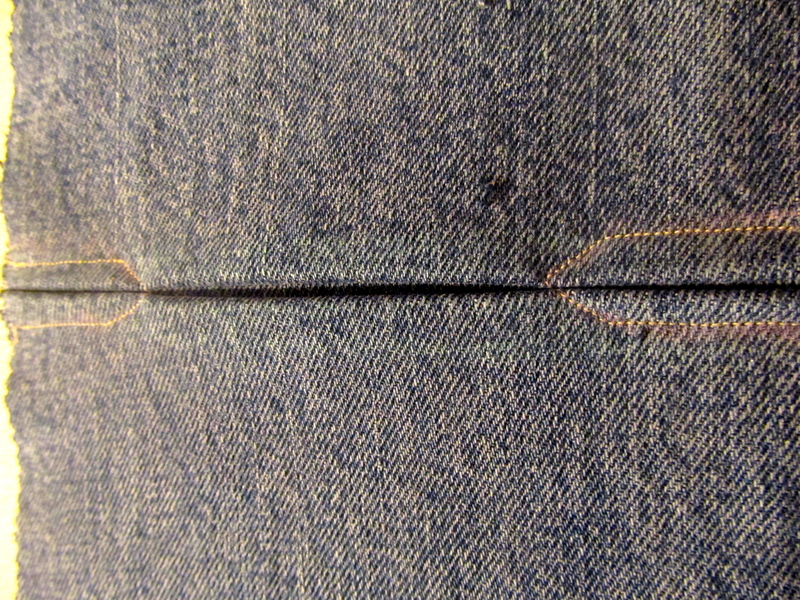 Top stitch down the seam allowance. I pinned it first. 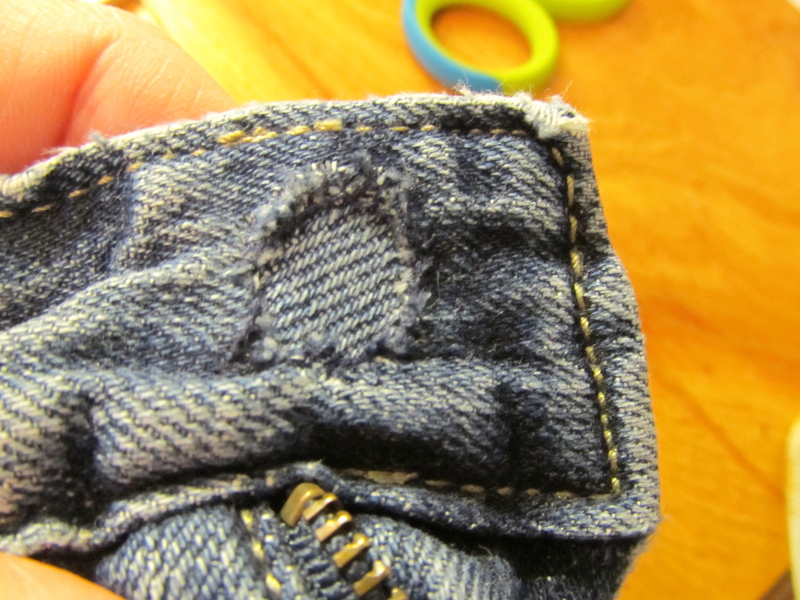 Open up the seam where you joined the ends of the waist band loop. Measure around your child’s waist and add an inch to determine the length of your elastic. Thread through your elastic. 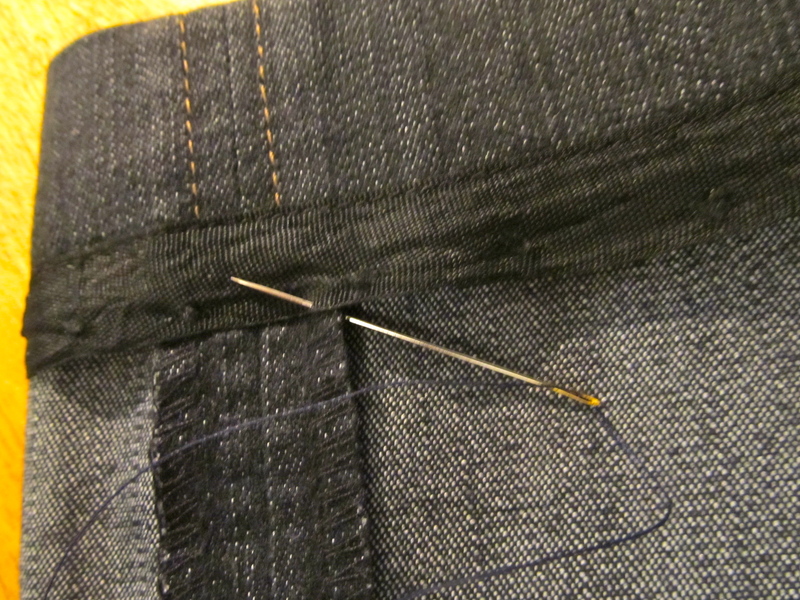 Attaching a large pin to the end of the elastic helps. 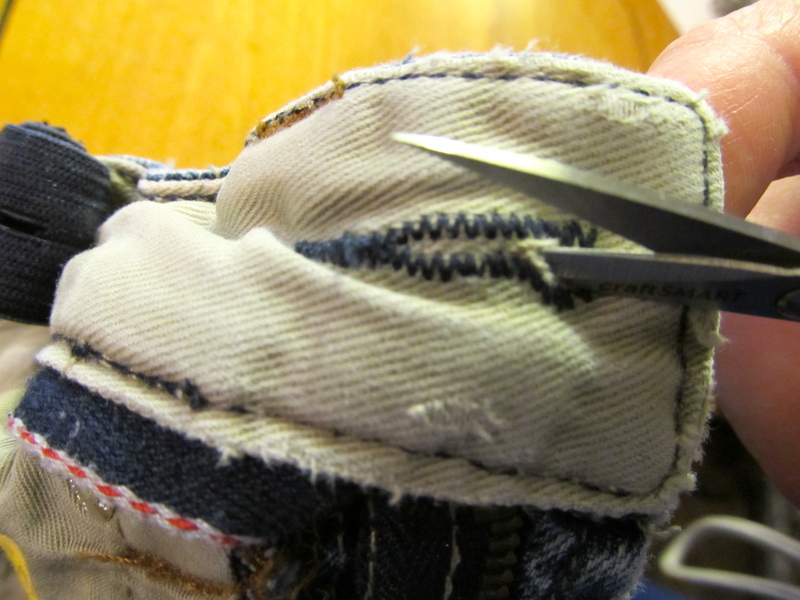 Overlap the ends of the elastic about 1″ and sew back and forth many times to attach them securely. 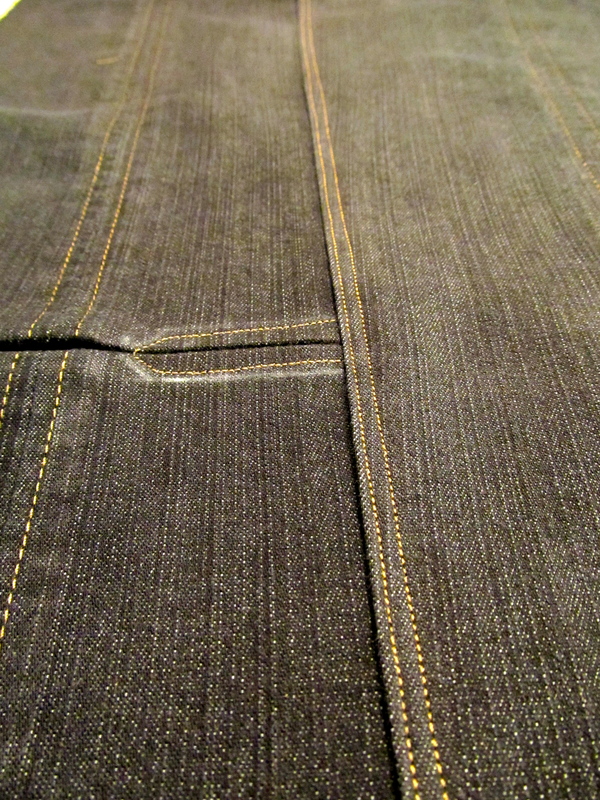 When finished feed all of the elastic back into the pants and hand stitch the waistband opening closed. 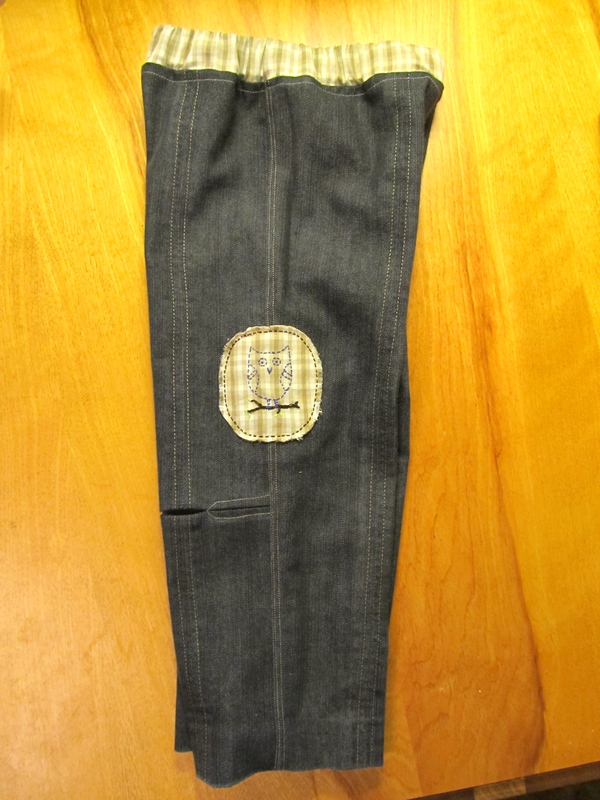 I restitched the hem of the pant legs. I didn’t wait until after washing these to photograph them so the chalk lines at the knee are still there. Here they are being worn by Eli. 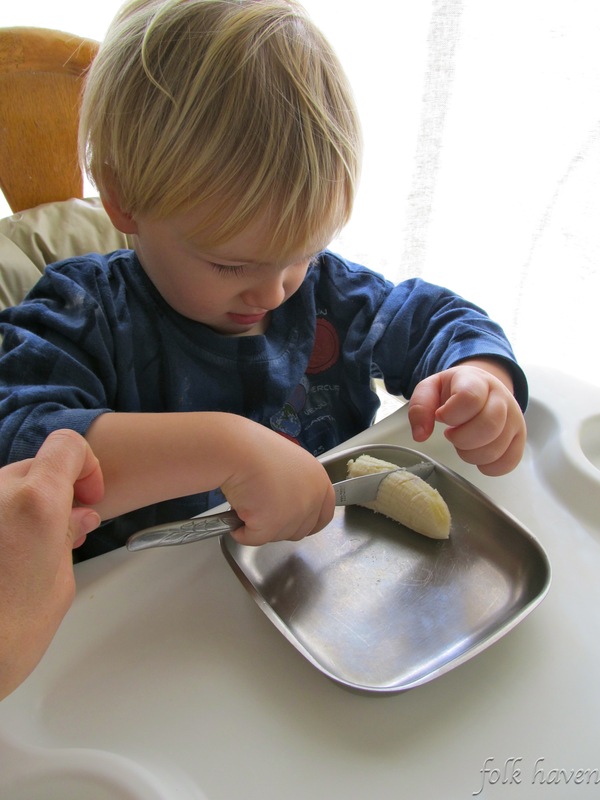 Today we took Eli to have the swallow study done. Thank you to all who prayed for Eli and this procedure. 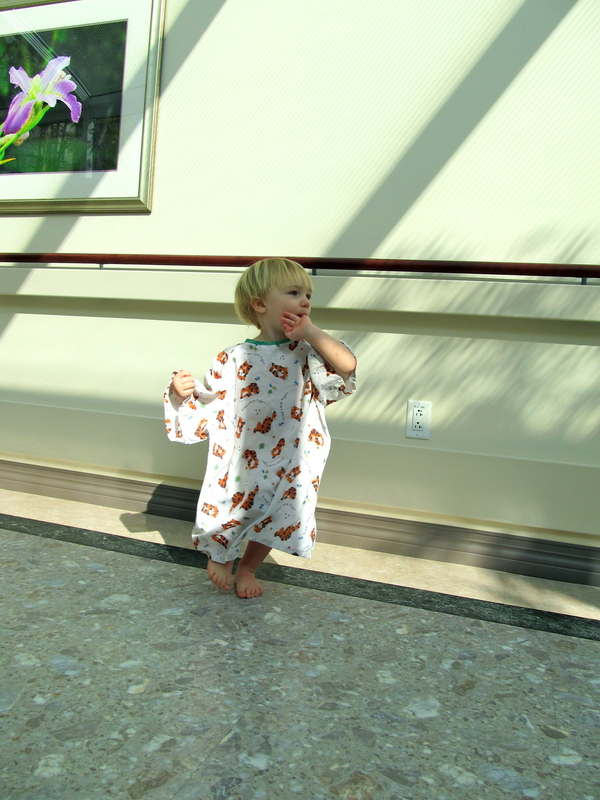 A major answer to prayer was that we were both not only allowed to stay with Eli during the procedure, but we were encouraged to. I had been so nervous that they would expect us both to step out of the room, and that we would need to try to insist otherwise. 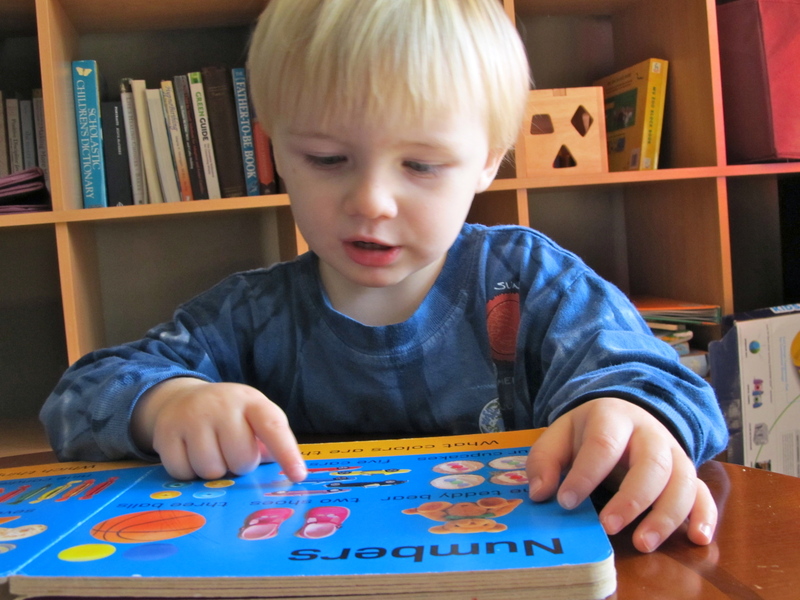 Since his developmental screening last month Eli’s oral vocabulary has expanded to 10 words. One of those words is “Go!” and he used it many times through out the day today starting with the first waiting room where we signed in. 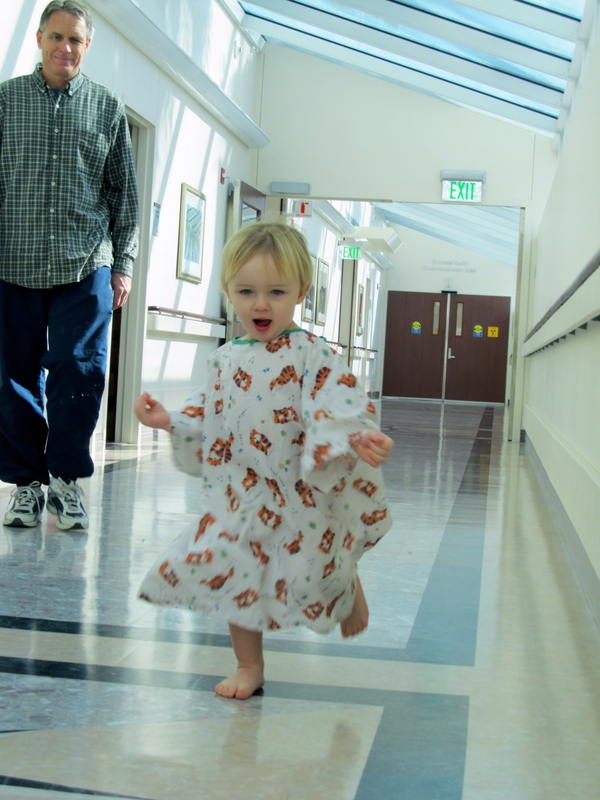 “Go!” was always accompanied by him pointing to the last door we had walked through. He had to drink a lot of barium to get a good contrast for the x-rays. Even though he was thirsty and hungry he was in no way interested in drinking the barium. We tried putting some in a paper coffee cup as he likes sampling the dregs of my soy chai latte whenever the opportunity presents itself. The method earned us perhaps 2 or 3 sips. Can’t say I blame him for not wanting to drink liquid chalk. In all he drank less than 1/3 of what they wanted him to drink. We gave him some salty potato chips in an attempt to make him thirsty. 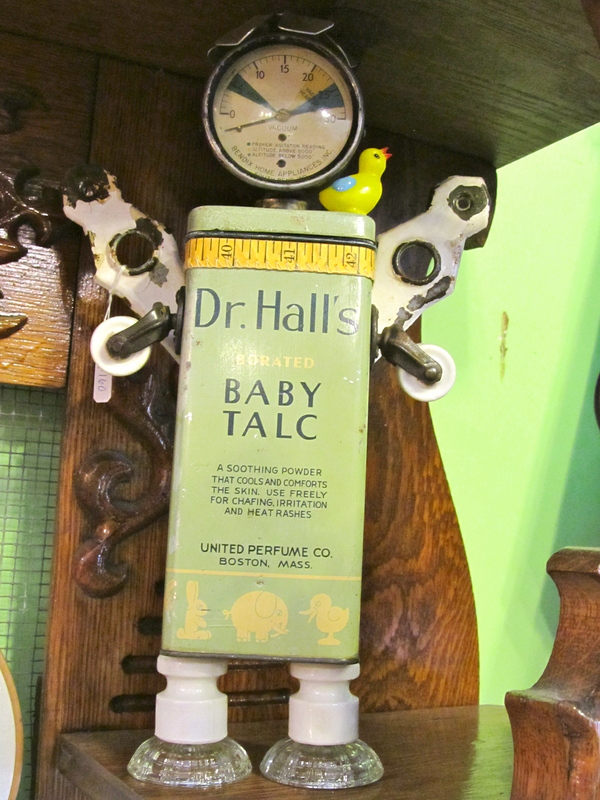 They tried giving him a thinner solution mixed with Pedialite, but the taste was pretty bad. He drank less than 1/2 oz of that although he did want to clutch it in his hand all the while. The x-ray process really frightened Eli. 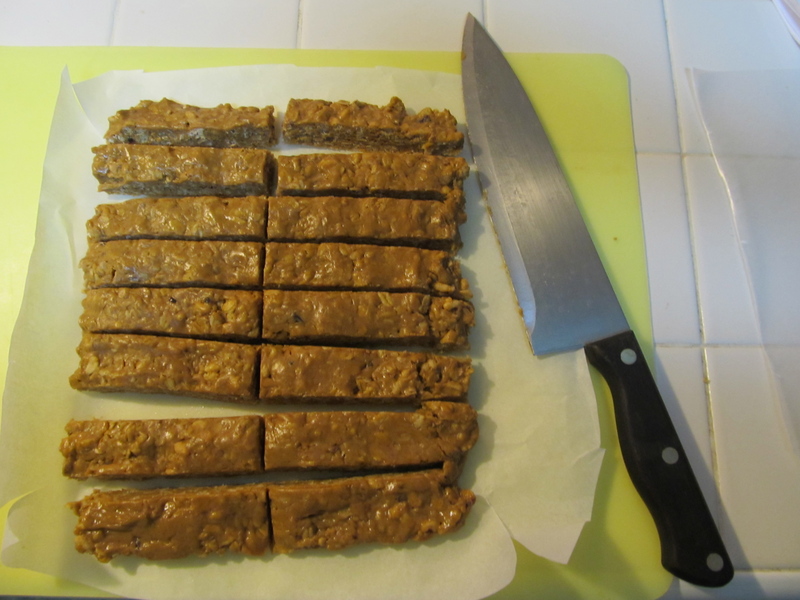 So that his bowels would work and move the barium through his digestive track, allowing for the x-rays of his small bowel, we were encouraged to take him to the cafeteria where he could relax. He watched Baby Signing Time there for a while, but then he slipped and fell flat on his face, so that was the end of cafeteria time. 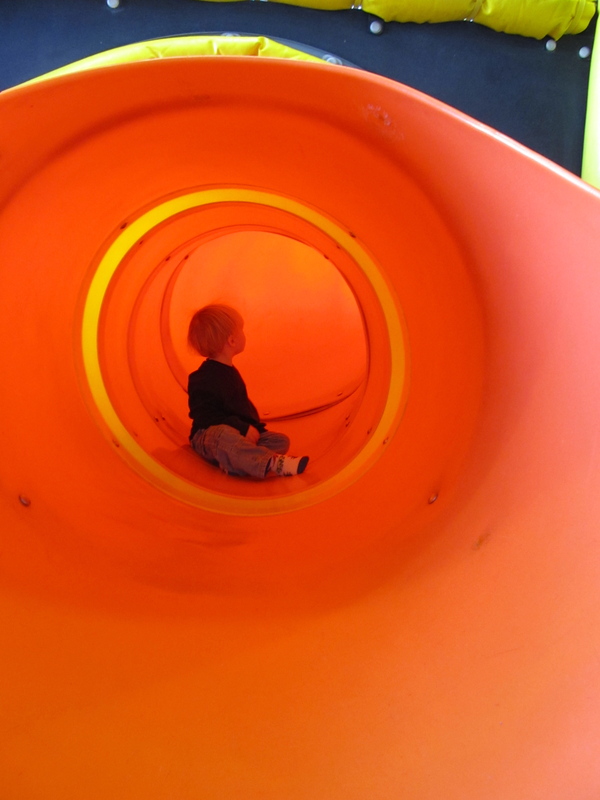 This time of exploration gave him a bit of familiarity and confidence for the great escape he attempted right before the second round of x-rays. He didn’t get too far before he was caught by Daddy. We tried distracting him with The Foot Book, but only made it through about 5 pages. He did enjoy commandeering the remote for the waiting room t.v. The only other person waiting there was reading her Kindle so it wasn’t a problem. 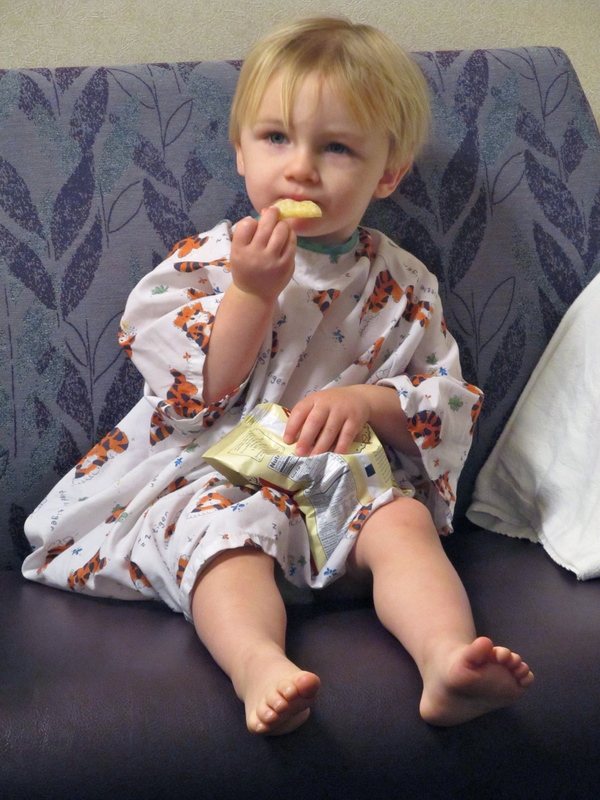 From the first set of x-rays they were able to determine that Eli’s esophagus is working fine. So nothing in this test pointed to the reason why he seems to gag so easily. Because he had taken in so little barium, and perhaps due to how much he wiggled as well, the image quality of the second set of x-rays was not so great. 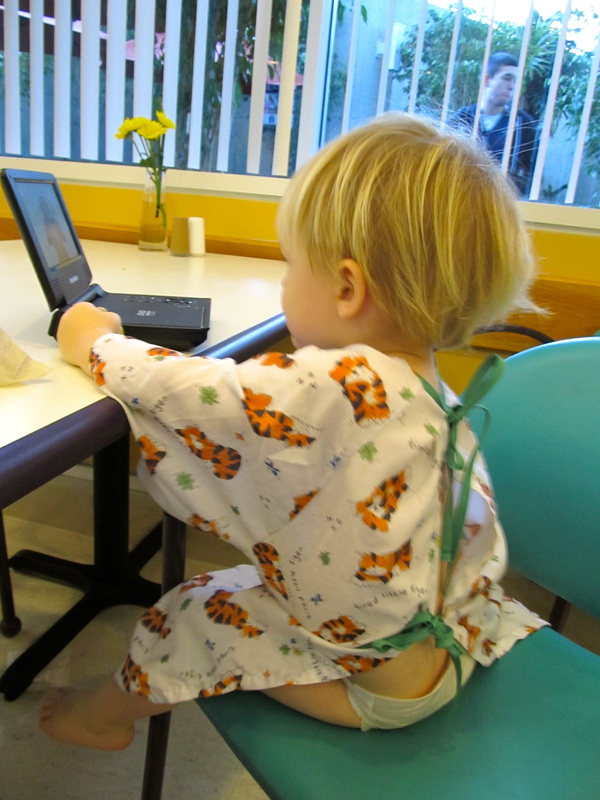 Eli was shrieking and more than ready to go home when the doctor began pointing to the image on the screen and saying something about cystic fibrosis. Wha..??? I don’t know why he was going there. Perhaps the test he had done is one commonly used to indicate that disease. I couldn’t hear him or focus on what he was saying, so after asking a clarifying question and ending up even more confused I decided we’d just wait to speak with Eli’s pediatrician (or whoever is taking over for her maternity leave). I really don’t have any reason to think that there is something to worry about here. We have never had the sort of problems with Eli that would put CF on our radar. And I’m choosing not to obsess. (“Did he SEE something on the x-ray?”) But still, it is quite disturbing to hear a doctor casually toss about the name of a terminal illness in a discussion about your child. Not surprisingly, Eli fell asleep on the way home. Once home he continued sleeping for a record setting 5 hour nap! 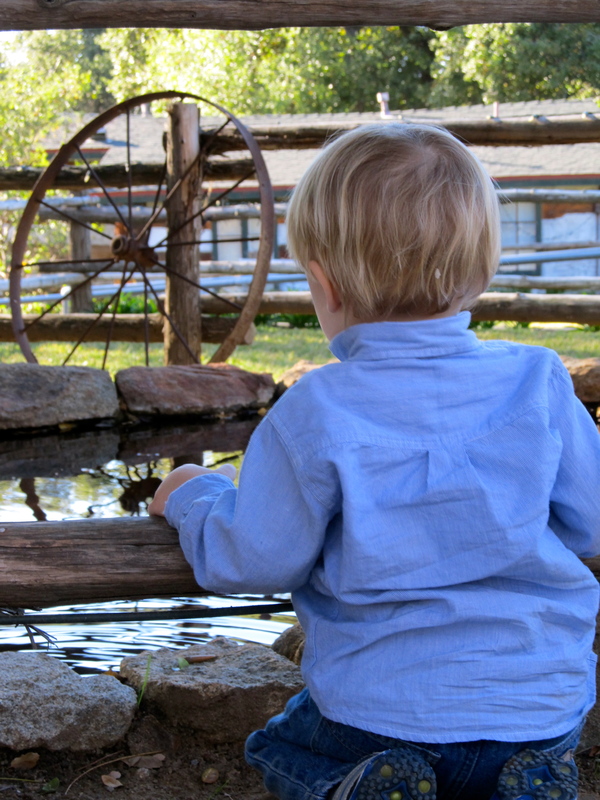 So since his first developmental screening, here is a run down of the information we have gathered. 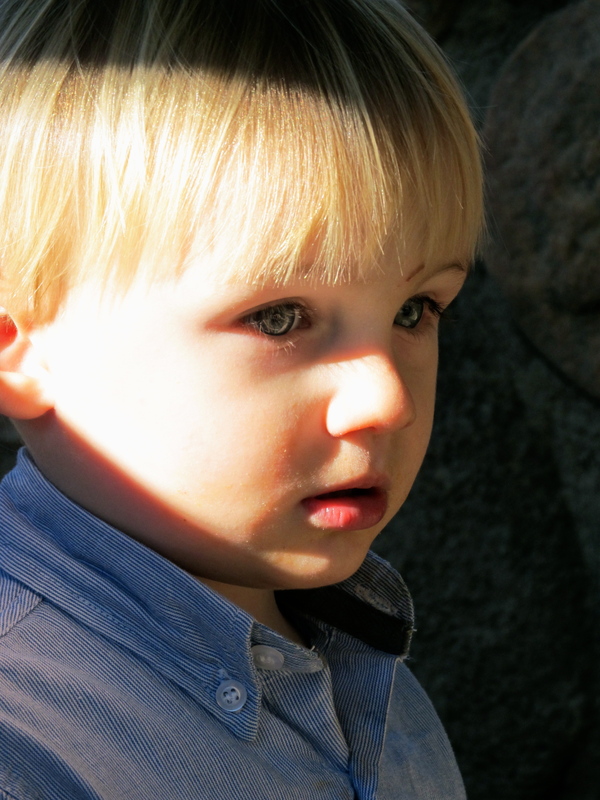 According to the audiologist, Eli’s hearing seems to be normal for his age. They want to test him on a yearly basis due to our family history of hearing loss. 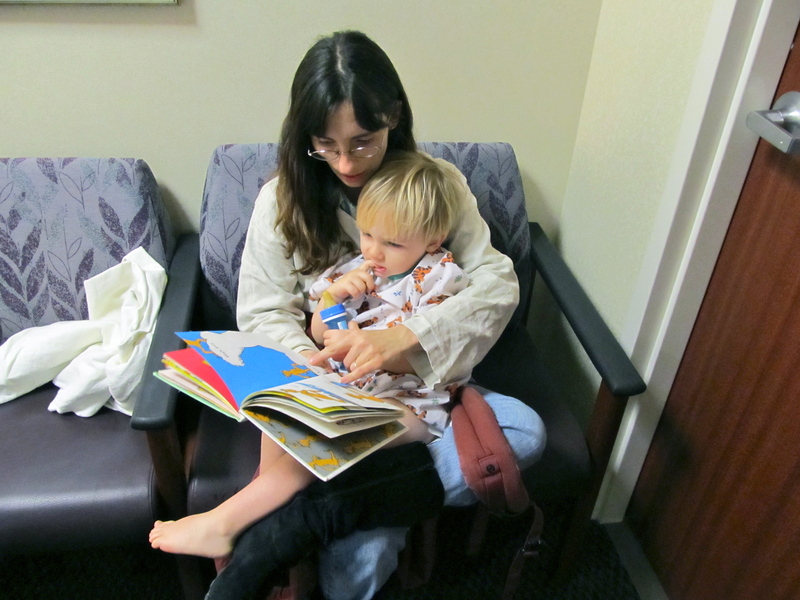 The ophthalmologist is fairly confident that Eli’s vision is normal. His left eye may appear to be misaligned when he is focusing due to immature facial features where the folds of eyelid skin cover more of the white of the eye than they will later when he has grown more. There is even a fancy word for it … pseudostrabismus. He wants to see Eli again in 4 months, just to be certain. He certainly looks plenty verbal! Since his screening a month ago not only has Eli gained some oral vocabulary, but his signing has expanded to about 50 words. The insurance is requiring a second opinion so he will be having a more extensive speech screening tomorrow with a different organization and an OT evaluation there on Monday. It will be interesting what the results to those screenings will be. Completely aside from the therapies the insurance may or may not cover, the Regional Center is offering Eli group therapy from 9 – 11 a.m. on Tuesdays and Thursdays, as well as individual speech therapy for a hour after class on Tuesdays. Add to that whatever therapy the insurance offers, or if they deny the Regional Center will offer the additional therapy, it looks like we will be very busy. 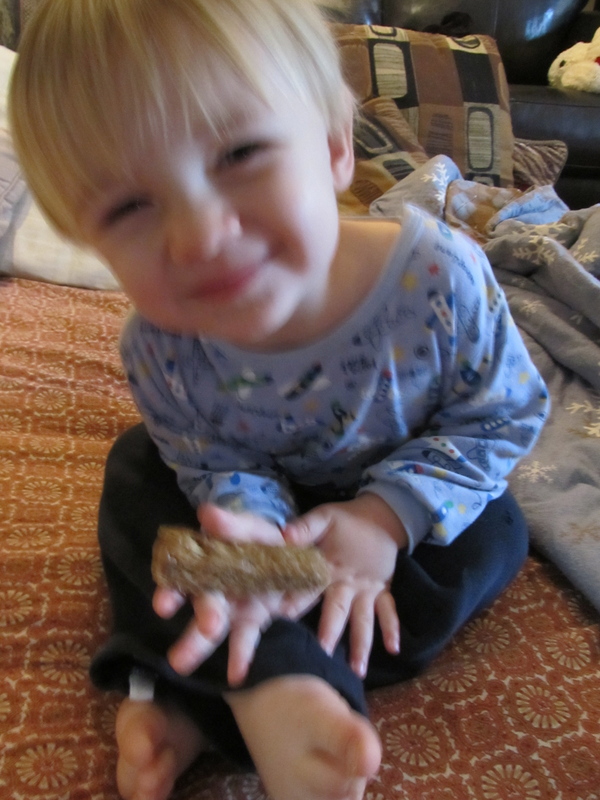 The last issue we are dealing with is that Eli has now had 2 allergic reactions (hives) after exposure to peanuts. 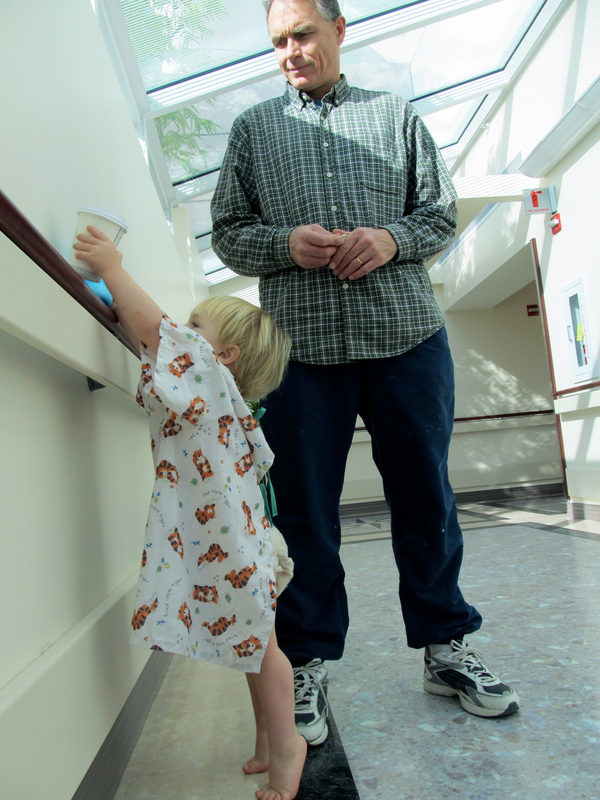 He will be skin tested again on January 27 to see if he does indeed have a peanut allergy. In the meantime his doctor gave us a prescription for the Epi-pen to have on hand. I’ll post another update at some point down the road. Thank you for your interest in our sweet boy! One interesting suggestion was to put in a diamond crotch gusset, which I had never even heard of before. I Googled it and learned that it is used to allow for greater range of motion by people with very active life-styles (read “Chuck Norris”). I think it would be a great idea for toddler pants. However I also needed to increase the amount of fabric around the waist and hips so I went with the bum-wedge in the end. I intend to explore the diamond gusset idea in the future though. 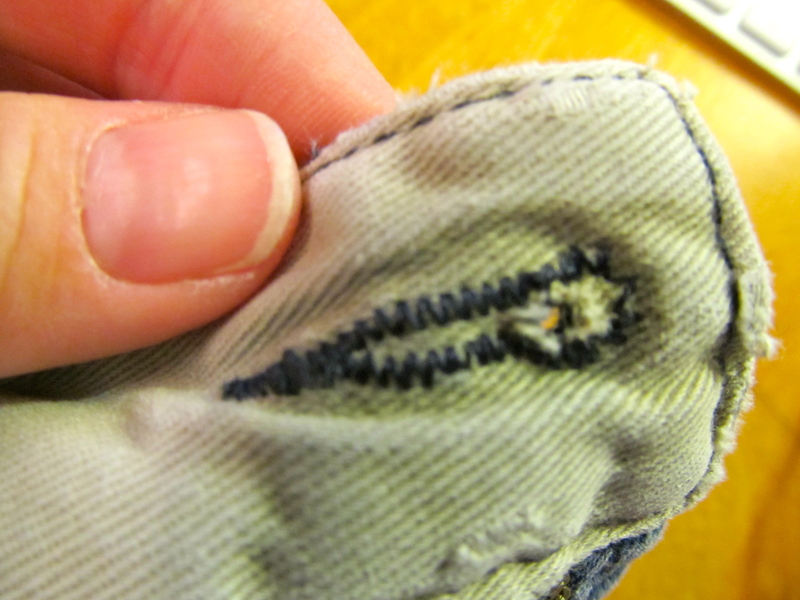 I opened up the seam running up the back of the pants. I measured the necessary width for my wedge, REMEMBERING to include seam allowances this time! Here it is sewn into place. 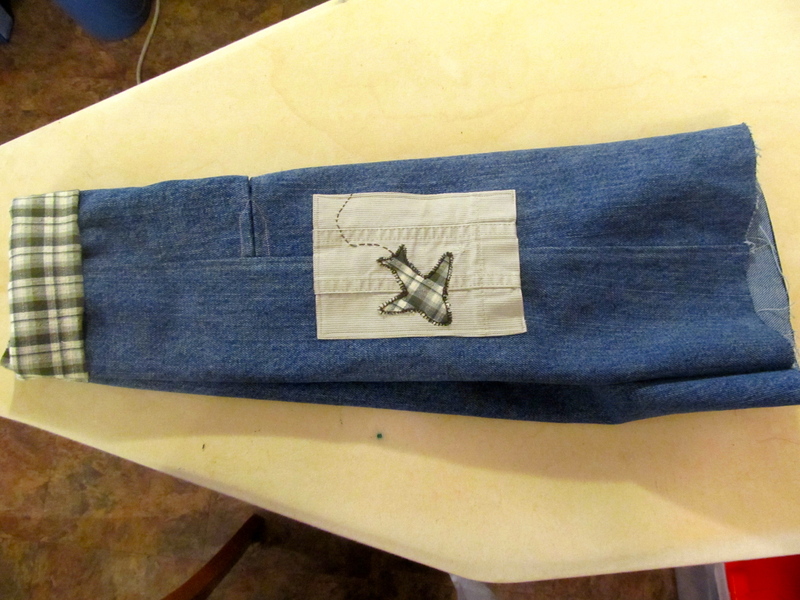 I took the tag from the back of the jeans I had taken all of the denim fabric from for these pants, removed the brand portion and sewed it into the back of the waistband. 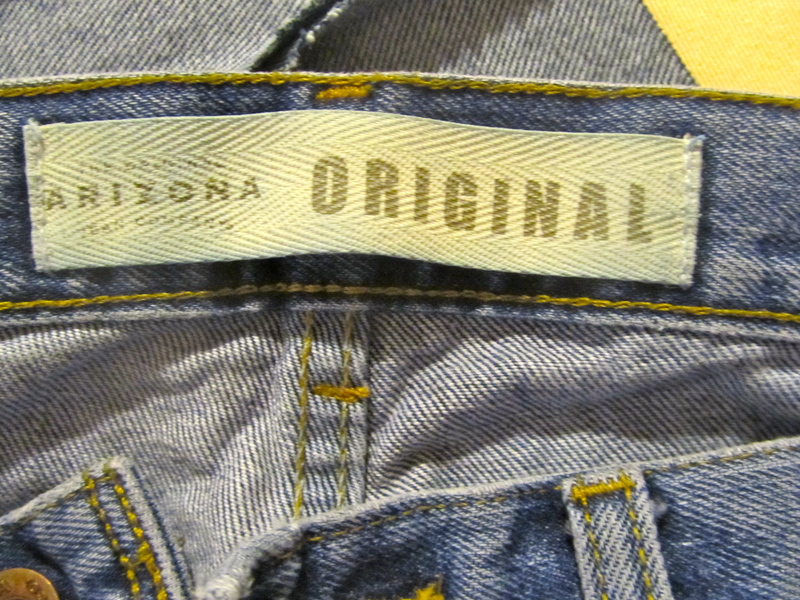 If nothing else these pants are “Original” (even if the tag is not)! 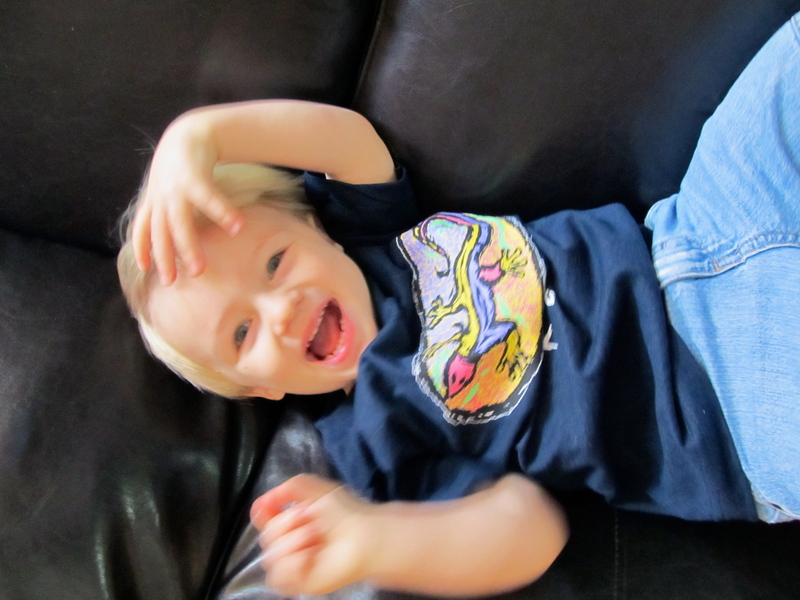 I had Eli model the jeans so I could quickly get some photos as it may be a couple of days before I get them to Alan. Alan won’t fill them out quite as much and I think they will fit him just fine. You can see the knee pleat is rather below the knee. Once Alan grows taller and the cuff is flipped down I think it may be in the right spot. We will see if it still fits him well enough to still be worn when he is a couple of inches taller. If he is at all like 2 of his sisters, i think there is a good chance it will. I had originally planned for this project to be used as a tutorial and took many pictures along the way. I don’t feel that I have much of a voice of authority for teaching others this time around though when I messed it up so royally. I do like the knee pleat idea though and will likely revisit it before too long and do a tutorial then. I’ve had a slow start to sewing this year. Finally, I got started on a pair of pants I’ve been wanting to make for a couple of months. I traced a pair of Eli’s pants that are currently a good fit to make a new pattern. Do you see what I forgot? Yep. There is an appalling lack of seam allowances. I ‘m not concerned with the the top or the bottom of the pants as I’ll be adding other fabrics there (and I did remember to add a little extra length), but the seams around the seat and crotch and down the legs… Uh-oh. Of course I didn’t notice until I had it pretty much sewn up. Little Alan is the same height as Eli but several pounds lighter. Even so, these certainly don’t look like they will accommodate a little guy with a diaper, even if he is a string bean. Here’s the thing. I’m trying to decide if the pants are salvageable. I was pretty excited about the pocket on the side of one pant leg. Please excuse the tailor's pencil lines. These haven't been washed yet. Also, the fabric on the bottom is made to be worn as a cuff or down when Alan gets taller. It’s the first time I’ve done that as well. 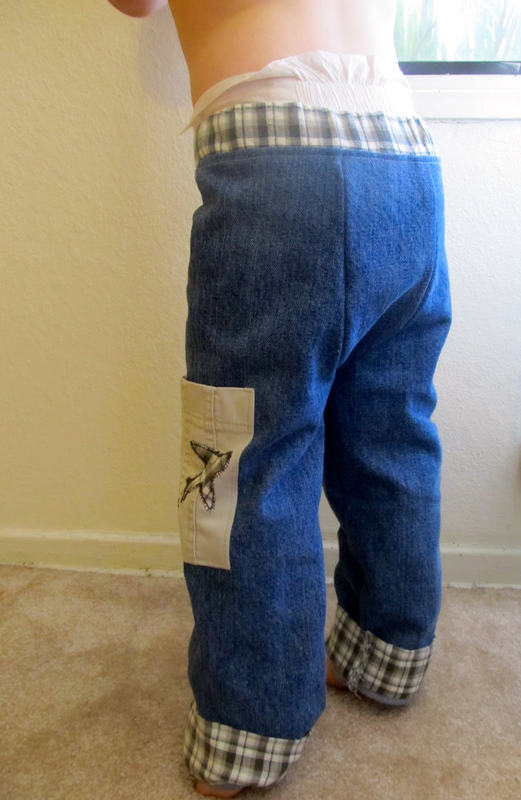 Of course with the denim material being much more uniform it would be less noticeable, Maybe I could add a back pocket to further disguise it, but would it look too “baby-ish” for toddler jeans? Should I just salvage the pocket and start anew? I’d really appreciate any feedback on this that I can get! I won’t be able to sew much this coming week as I have doctor’s appointments for Eli everyday but Wednesday. That gives me time to step back and think this through and gather your nuggets of sewing wisdom before I blunder ahead. And for those of you out there who pray, I’d really appreciate any prayers you might have for Eli on Thursday. We have to take him in for a swallow study. Eli chokes fairly often, even on his own saliva, and it’s possible his tongue not working quite right could be a part of the speech delay he has. It seems he chews up and spits out more food than he swallows a lot of the time. Between getting him up a couple of hours earlier than usual (lately he won’t sleep much before 11:30 p.m.), not feeding him or giving him anything to drink, getting him to agree to swallow the barium and then either having him brave the x-ray alone, or convincing the hospital staff to allow me to stay with him during the actual x-rays…. 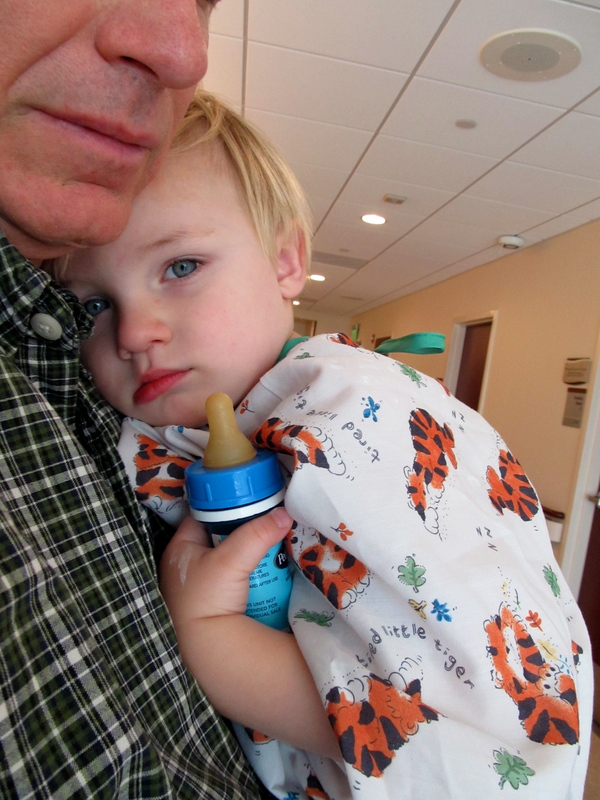 Then continuing to not allow him to eat, drink, or nurse so they can do more x-rays a while later to see the state of his small intestine… Let’s just say we are really going to need some Divine intervention to get him to co-operate through all of this. And of course, co-operation aside, I’d like it to be as un-traumatic for him as possible as well. Thank you for reading, and for any support, sewing or prayer, you might be willing to lend! 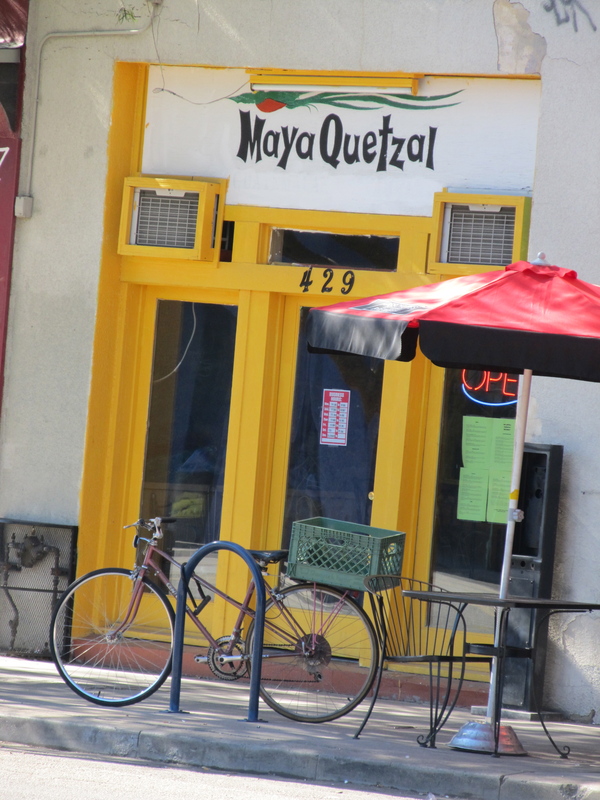 Popcycle of Tucson’s 4th Ave.
Fourth Ave. in Tucson, AZ is an interesting place to spend some time poking around. We tend to make a visit every time we are in town visiting family. 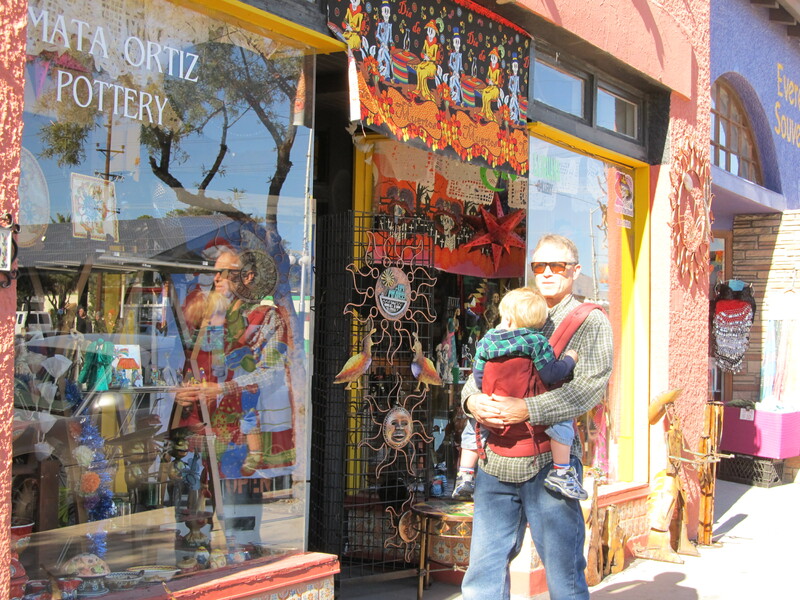 There are funky shops, great little cafes and restaurants, and a large Value Village thrift store. One shop in particular caught my attention on this visit. Presenting Popcycle. 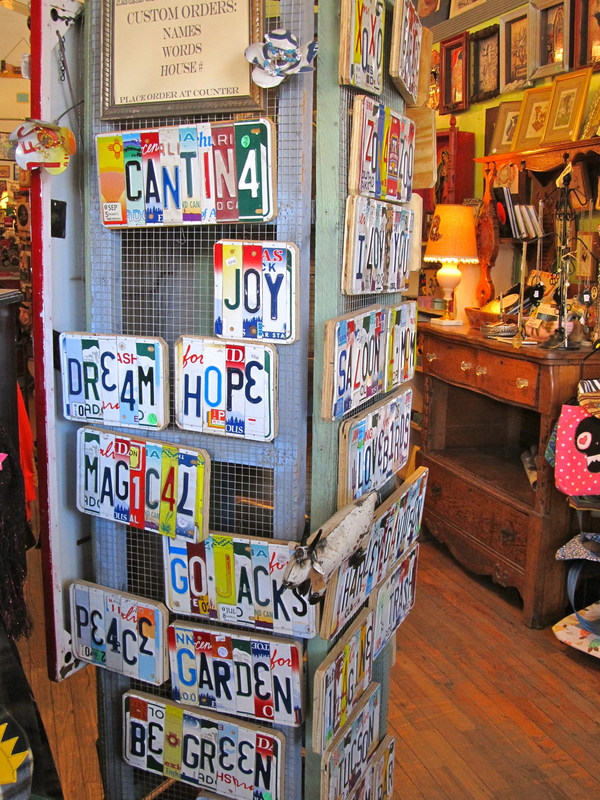 I liked these signs made with old license plates. 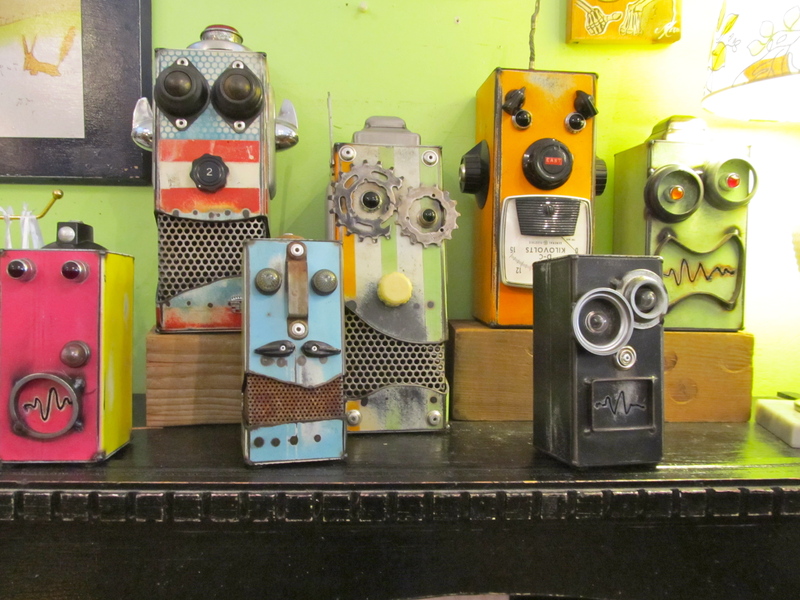 Here were a few whimsical robotish creations. 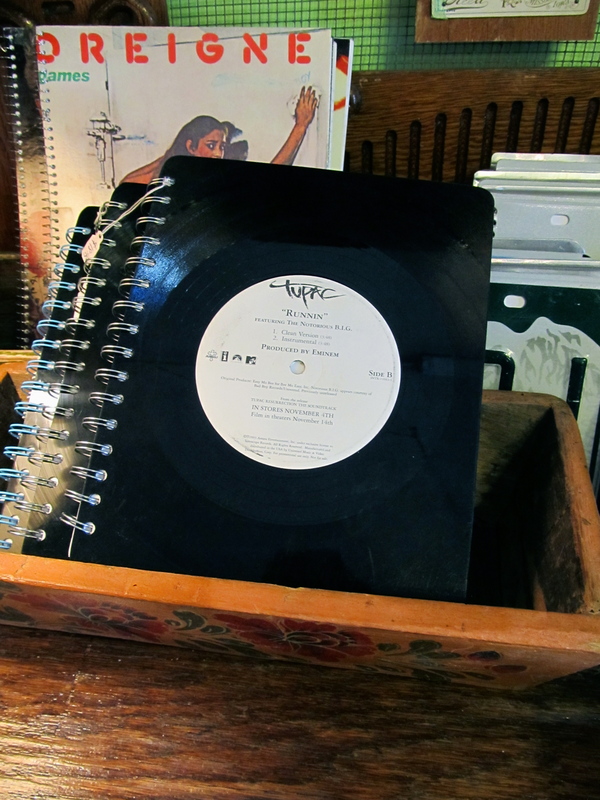 Notebook covers made from old vinyl records. 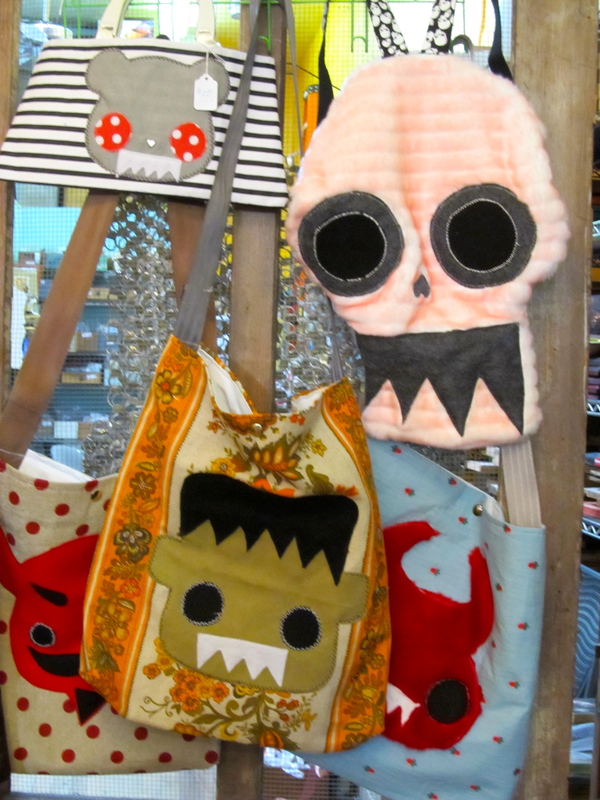 Monster-head design were in abundance around the store. 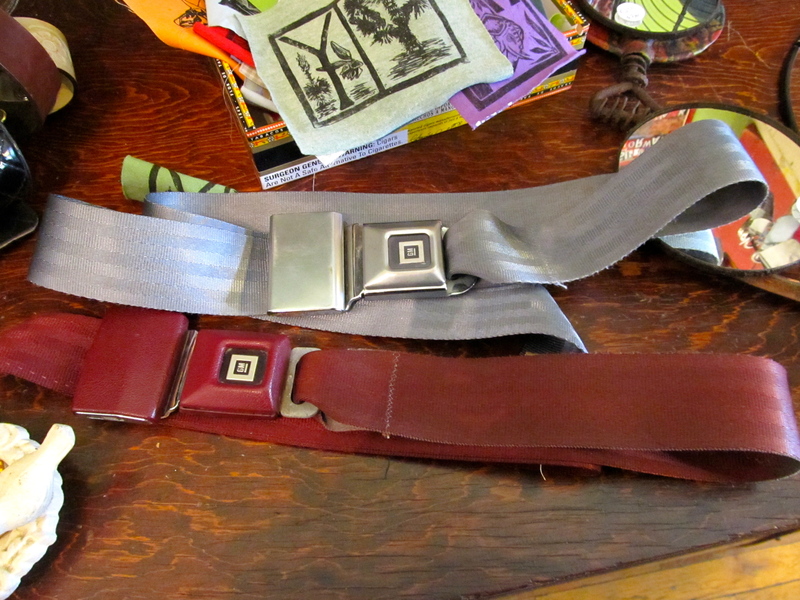 I’m not sure how comfortable these belts made from old car seat belts would be. 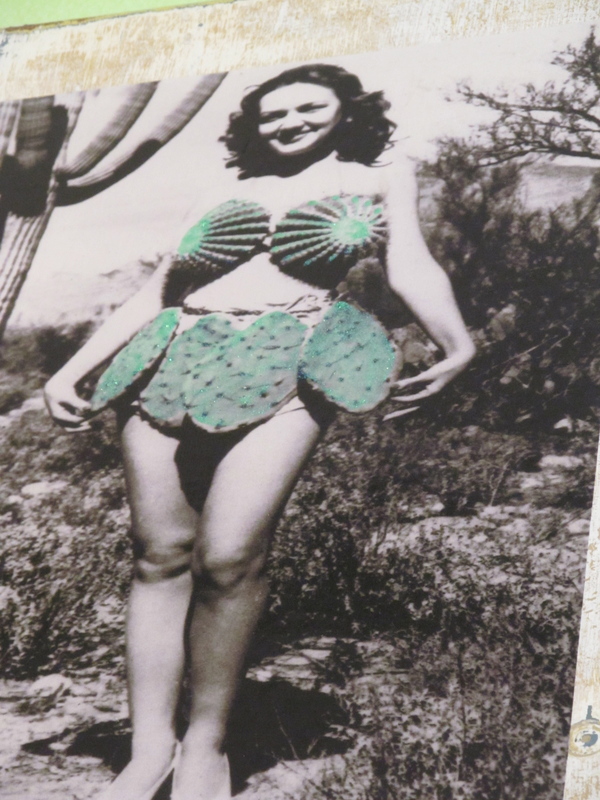 But they would certainly be more comfy than the cactus bikini… at least for the person on the receiving end of a hug. Old door knobs… decorated hanging pegs? 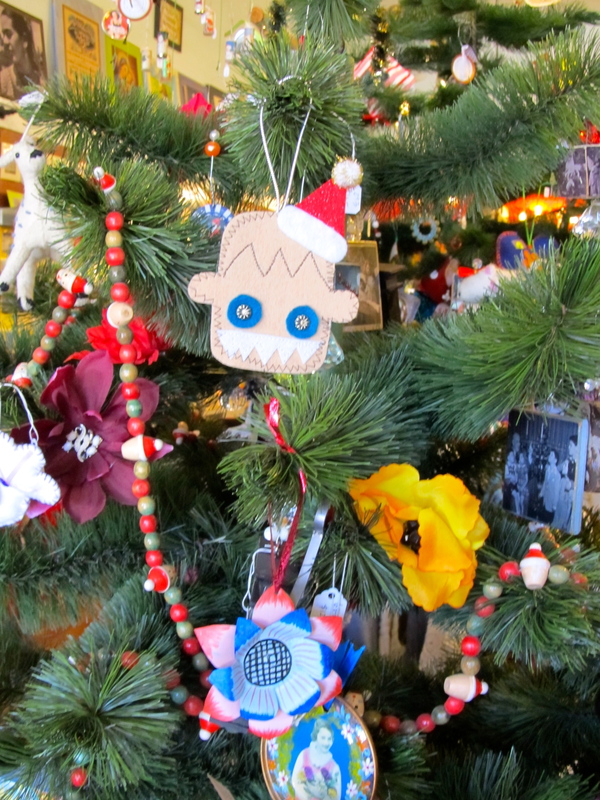 There were many more things but someone official told me they only allow a few photos per visitor. Ooops! I’d already taken more than a few so I stopped at that point. I suppose they have to protect themselves from people who get inspired and then make things themselves… especially if they have blogs and share ideas with other easily inspired sorts. As my goal isn’t depriving them of their livelihood, but rather just sharing something that I find interesting. (‘Cause if you know me at all you know I love putting old junk to new use!) 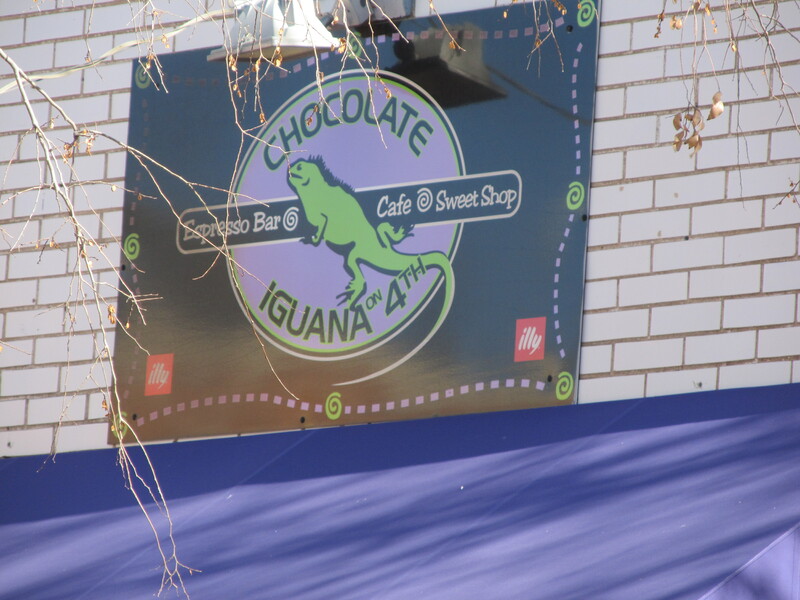 If you happen to be in Tucson you can find this store at 422 N. 4th Ave. (520-622-3297) or you can find them on the web at www.popcycleshop.com. 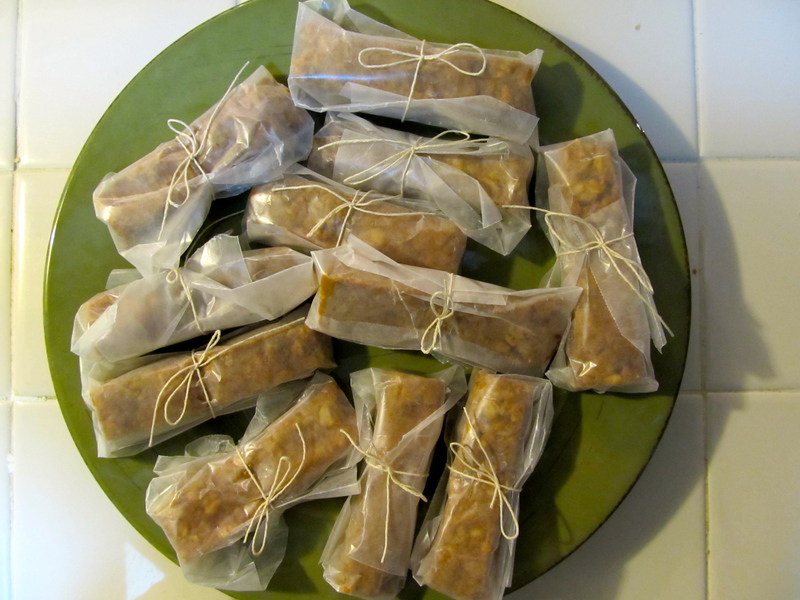 It looks like they sell to wholesalers but not individual consumers online. So much of the time you seem so BIG to me, incessantly growing as you are. I like this photo because here you still look small and baby-like. This past month has been a busy one for all of us. While this wasn’t your first Christmas (I think of it as your 3rd as your Baby’s First Christmas ornament was bought for the Christmas you celebrated with us in utero), you “got it” this year a little more than last. And you had a blast! You loved the time we spent surrounded by family in Tucson. 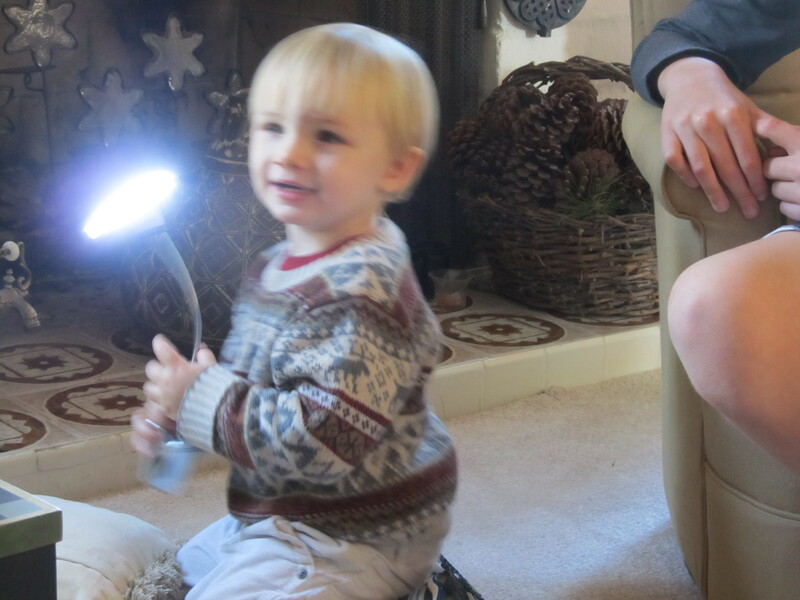 You played with your cousins and laughed and shrieked almost non-stop much of Christmas Day. You spent the time when everyone else was opening presents running laps through the living room and around through the kitchen. It was neat to see you overwhelmed by the excitement and joy of the day in a way that wasn’t tied to “what am I gonna get? 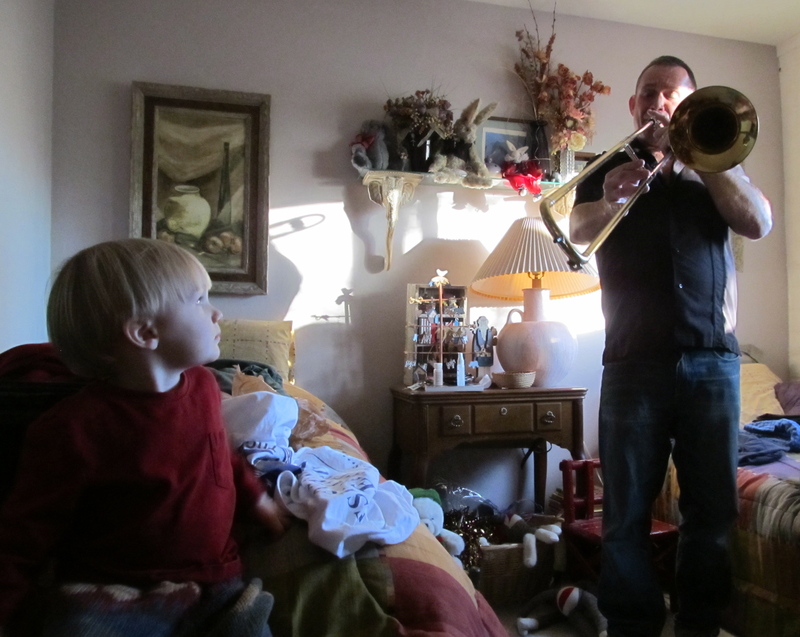 !” Eventually we caught you as you flew past and got you to open a few of your gifts. Once they were opened you discovered that you liked your gifts just fine, thank you very much. 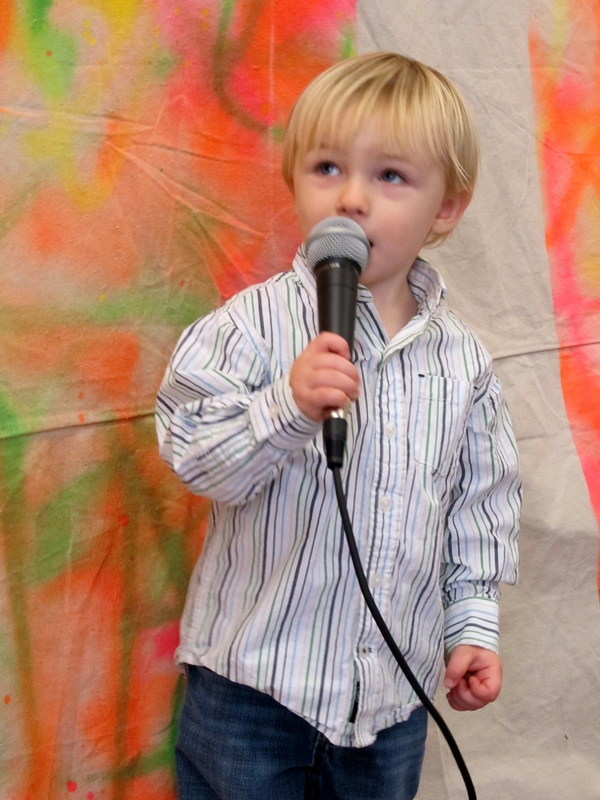 Over Christmas week you began saying Elmo, apple, and on Christmas Day, ” ‘Acki”. Aunt Jacki said it was the best Christmas present she’d ever gotten. 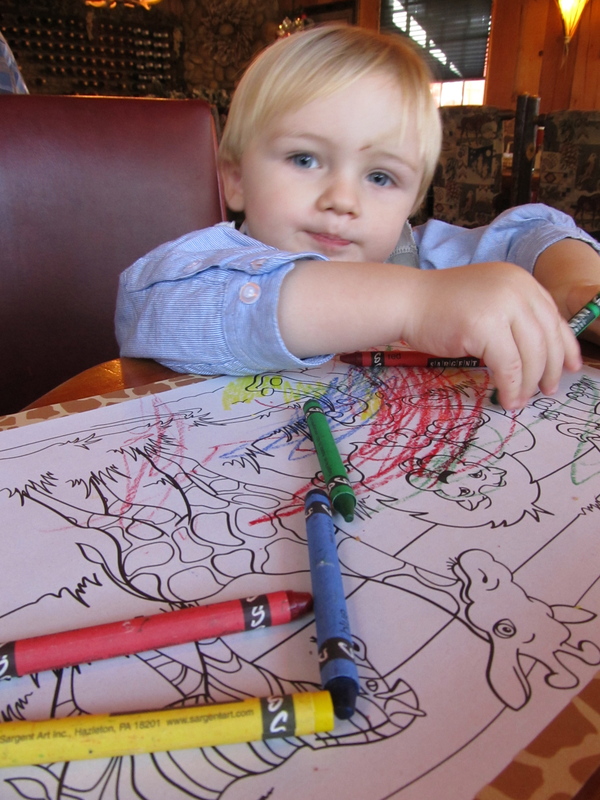 Coloring during a rest stop on the way back home. 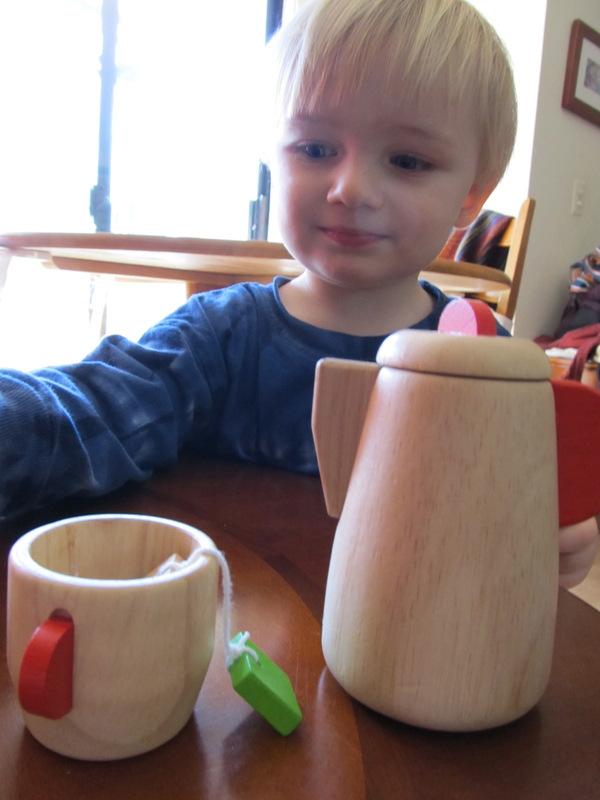 You are endlessly entertained by playing with your tea set. 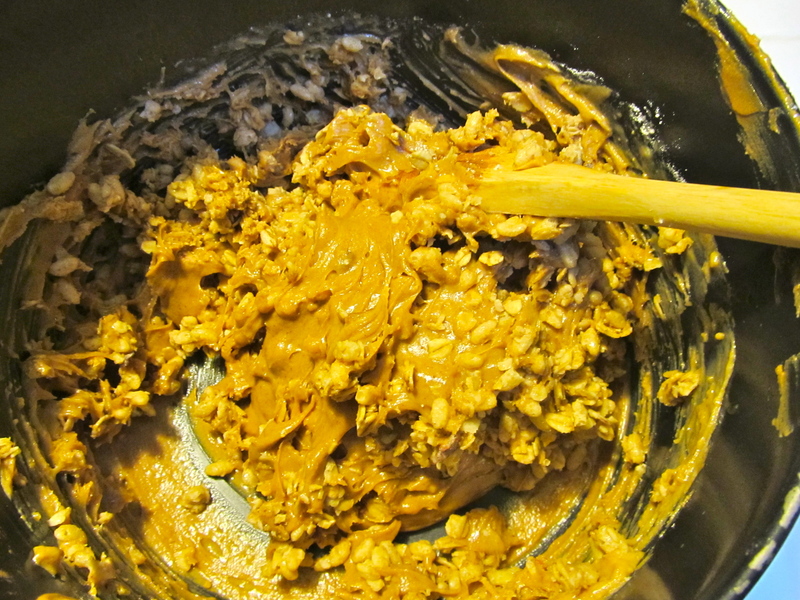 You love to dip the bag in the cup, pretend to stir with the little spoons, and especially to pour the hot! 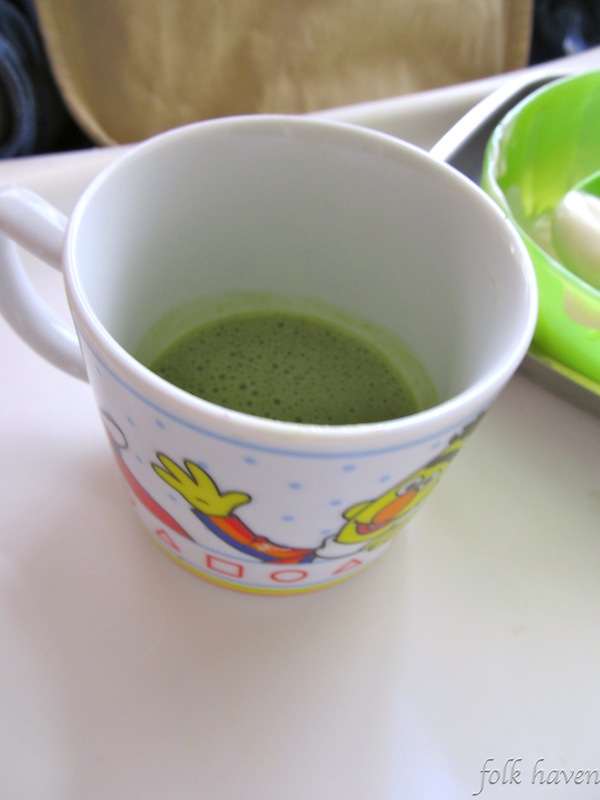 water and serve your father or me a cup. 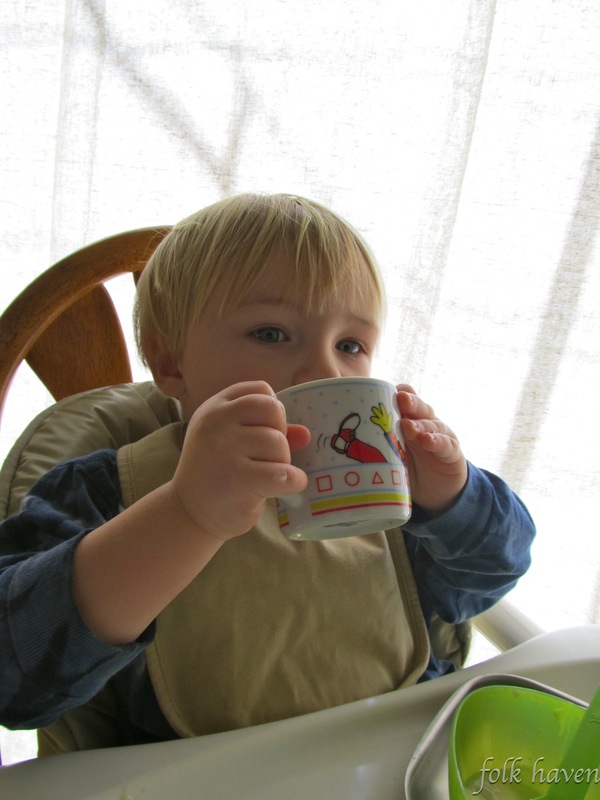 It is so cute to watch you blow on your “hot tea” before sipping. You are slowly showing more interest in books. 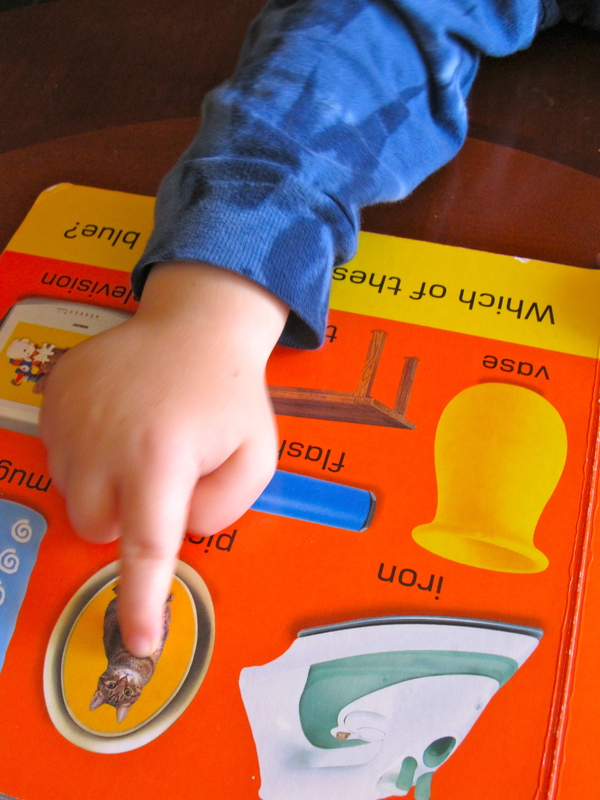 You’ve been enjoying this library book with pictures of everyday objects. You always have to emphatically point out cats, wherever they may be found. A regular chip off both the old blocks! 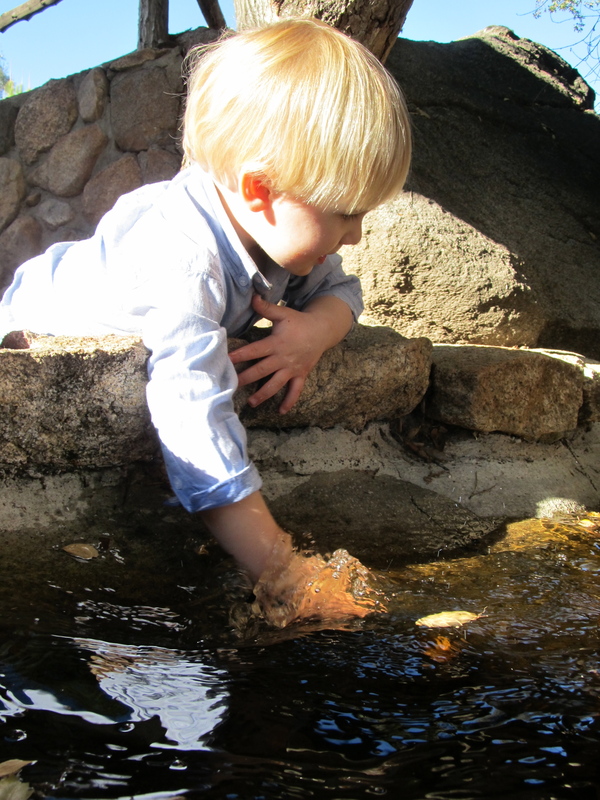 You still like nothing more than to play with water. 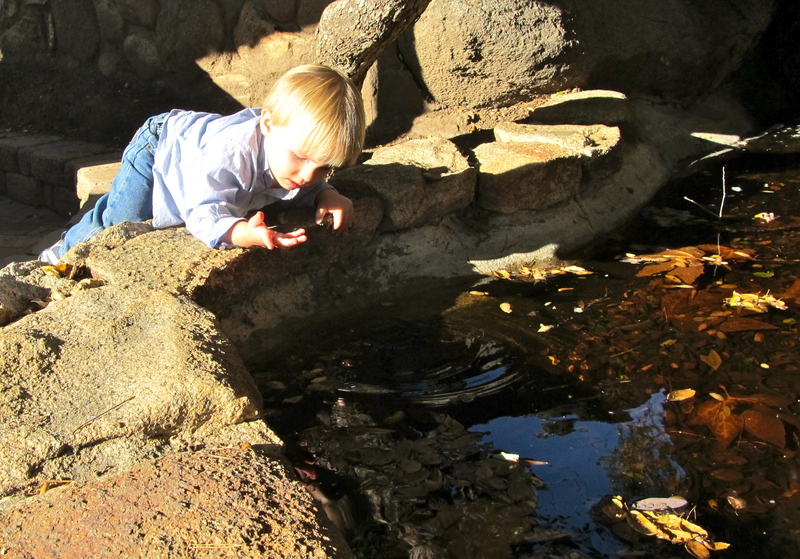 Here is your face when you first spied the water feature at the rest stop between Tucson and home. The momentary pause of wonder didn’t last long, of course. You remain incredibly affectionate. Your father and I are regularly on the receiving end of your hugs and kisses. I hope that doesn’t stop anytime soon. You also like to kiss anything cute, especially in animal form. 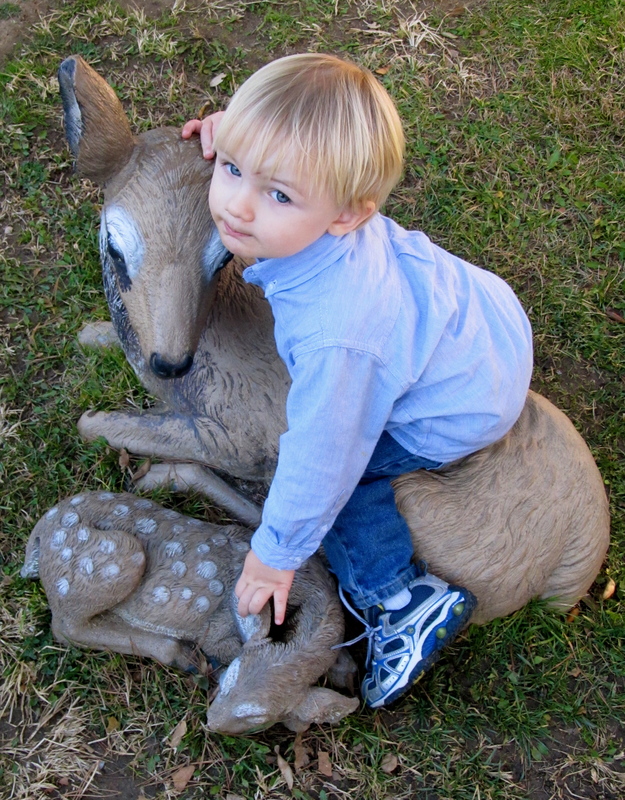 You must have kissed this deer at least 10 times. I just couldn’t catch the right moment on film. We are so blessed to have you in our lives, Eli. I bought a box of clothing for Eli from someone on Craigslist many months ago. I just pulled out these pants from storage as he is going up a size, and found that the snap is broken. It’s one of those pants with the adjustable waistband. 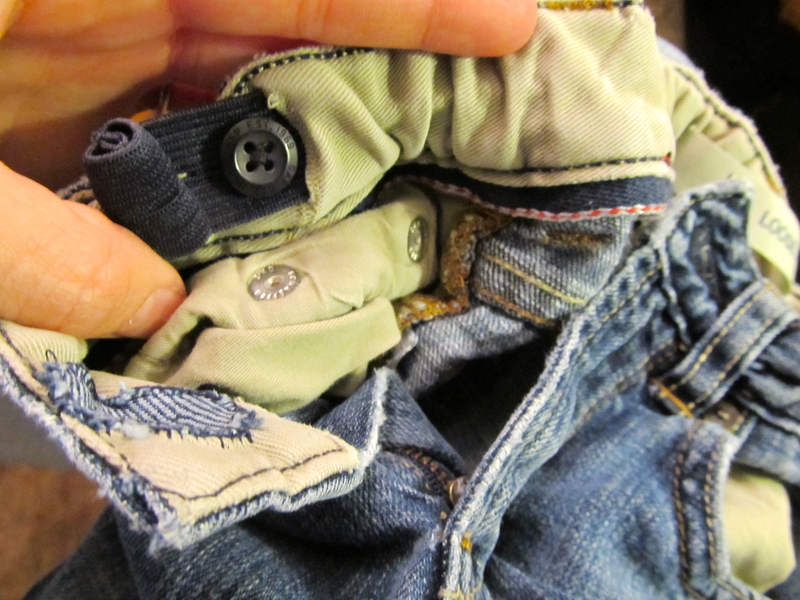 (I’d love to shake the hand of the genius who first put the buttonhole elastic in the back of toddler jeans!) Not a pair of jeans I wanted to shrug my shoulders and cut up for another purpose. First I used a small sharp pair of embroidery scissors to trim out the broken snap. 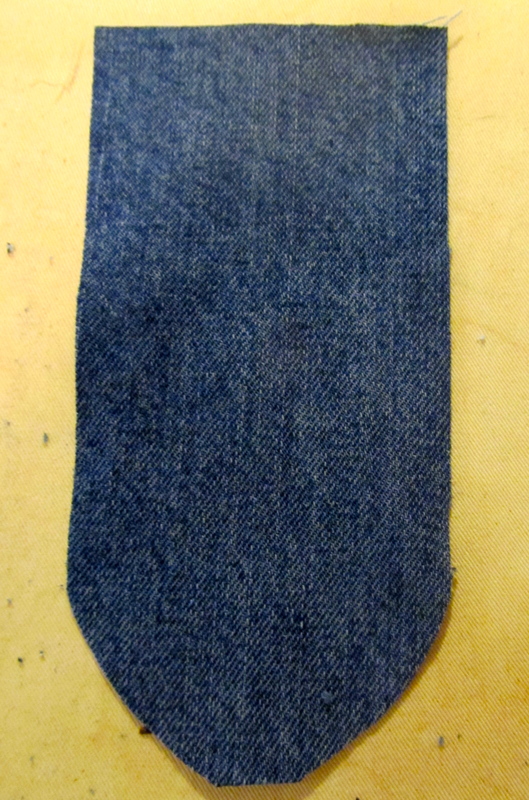 Then I cut a small circle of denim from another old pair of jeans. I was lucky to have one that was a very similar shade of blue in my stash. 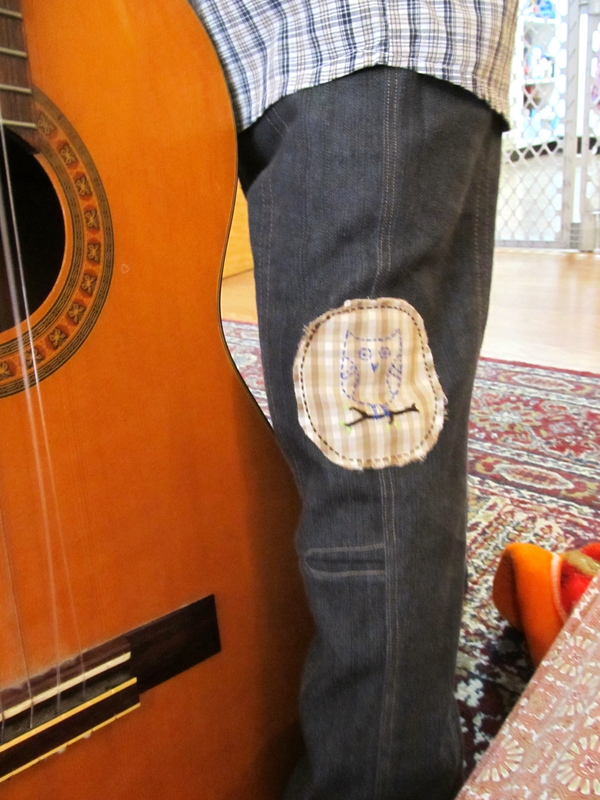 I then stitched it into place using a blanket stitch to contain the raw edges of both the denim patch and the jeans. 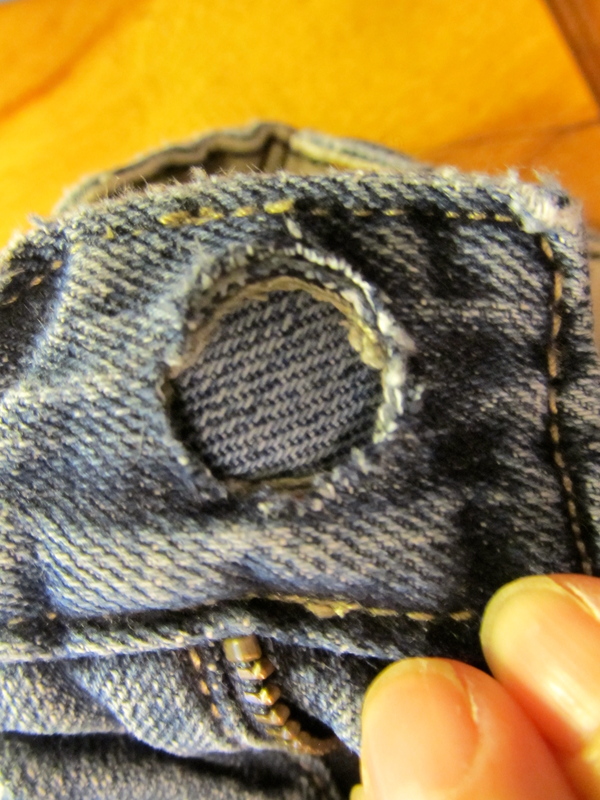 The “button hole” had never been cut open as with a snap it had just been sewn for looks. I used the embroidery scissors to do the honors. 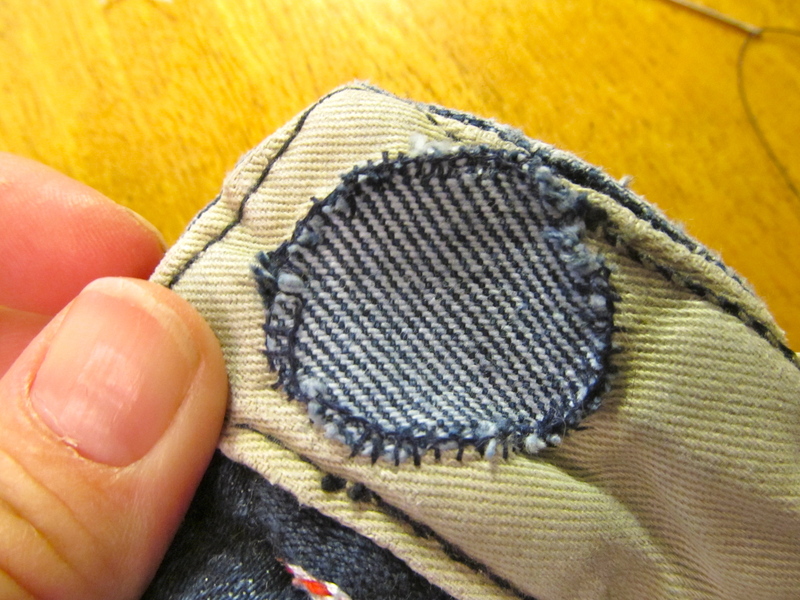 I chose a button that would fit through the button hole opening and sewed it on. If the stitching around the patch or the button threads seem to bother Eli when he wears the pants I can always go back in and sew a piece of shirt fabric over the whole thing, but if it isn’t necessary nobody will be seeing this side of the patch when he wears the pants. Here is the finished repair. I’m glad I didn’t just toss these jeans.